Uncategorized | Every good thing…. The best days in a boat owners life. At around 9 this morning the marina called. I told them I was sorry I did not make it out to change the lines as I was busy. As I was speaking with the this was who was asleep in my arms. Elizabeth Flora Lillian Monroe. 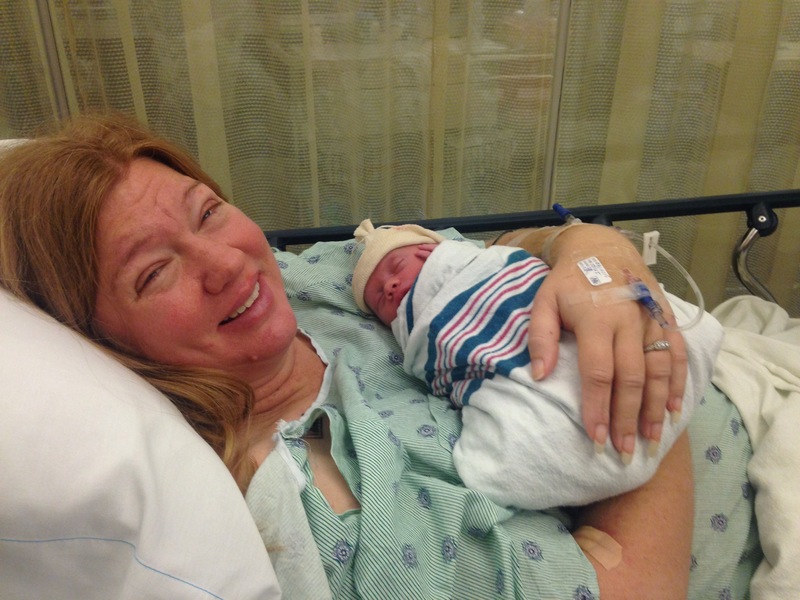 Born at 11:26 14 June 2015. 5 lbs 10 oz. 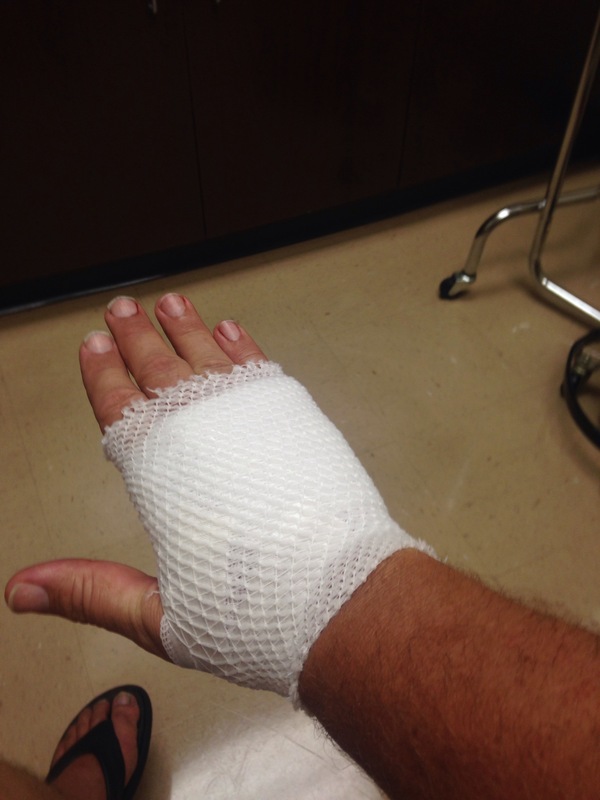 Ya, about those dock lines…. Monday I received a call from our new DockMaster in reference to our dock lines. We need to replace them as they are not acceptable. 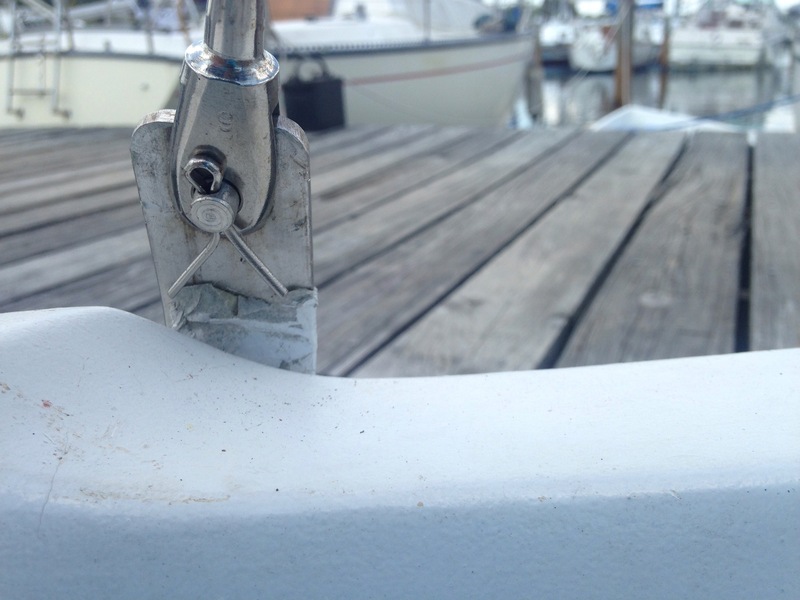 We noticed it Sunday moving the Bell, the cheap Chinese anchor rode I was using as docklines had degraded in the sun and are now falling to pieces. I ordered a new set of 5 double braid black lines to replace them. Seems that black is a unpopular color for dock lines as they were 30% the price of the blue or gold colored lines. Amazon delivered the lines Wednesday afternoon. Lori and I were going to run out to Titusville Friday after work and I was to replace the lines and then we were going to have dinner at Chef Larry’s before going home as we planned to really start prepping the house for baby girls arrival. 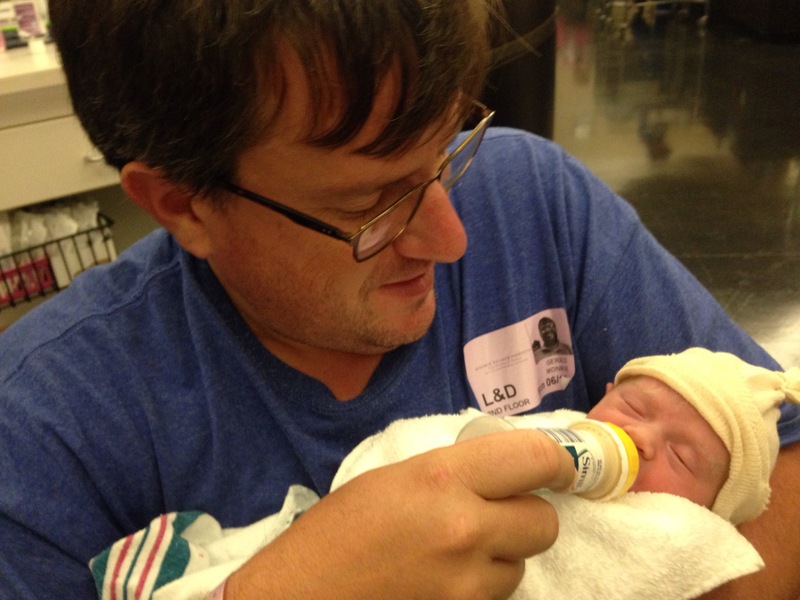 Thursday afternoon we went to the doctors office for Lori and Baby’s biweekly checkup. Baby gets 20 minutes on the monitor. Here you see a heart rate of 173. Baby is having a kick and push on mommy fest. Really living it up and healthy and active. Her rate is usually about 123 or so. 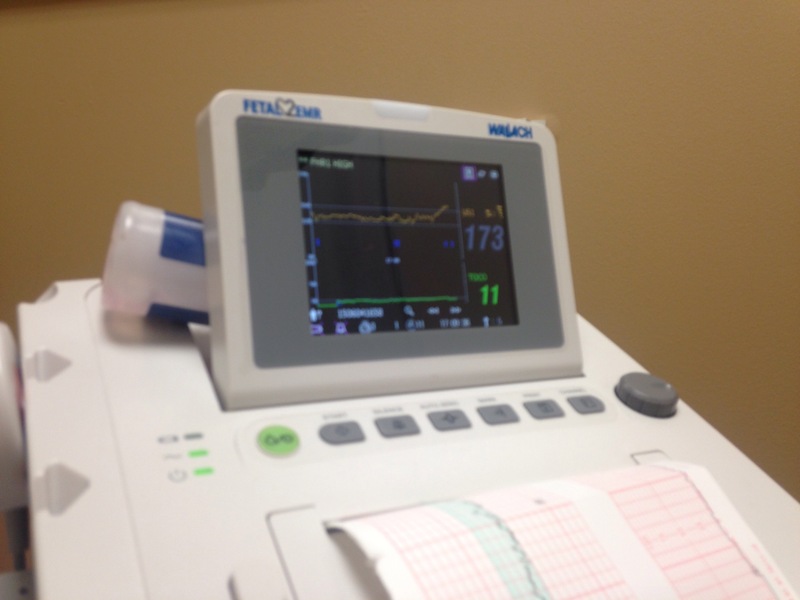 Loris blood pressure (BP) was high and Doc worried about preeclampsia decided it was best to send us to the hospital. 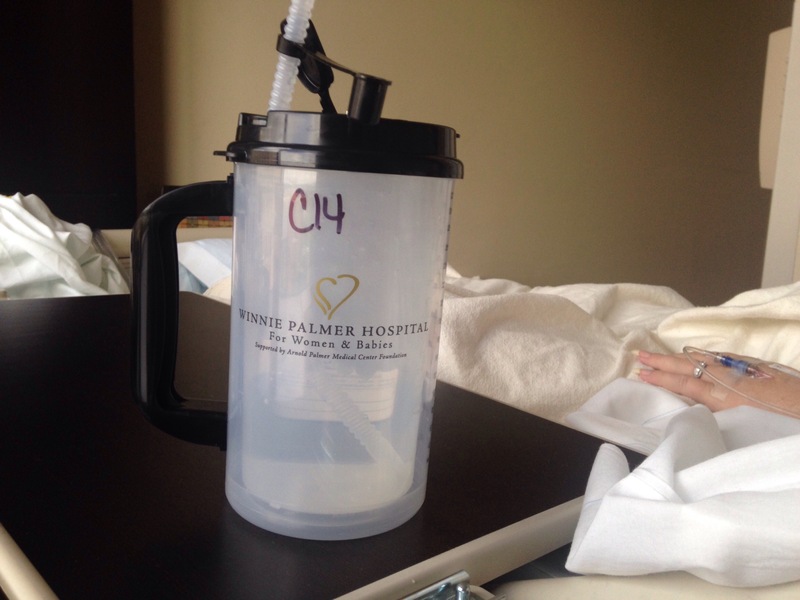 Winnie Palmer here in Orlando, they are the #2 hospital in the nation for baby deliveries. So here we are in still at the hospital , it is Saturday morning, and they have Lori’s BP under control with medication. With the baby being 36+ weeks along they are working towards getting Lori to deliver conventionally thru the use of drugs in the next day or so. 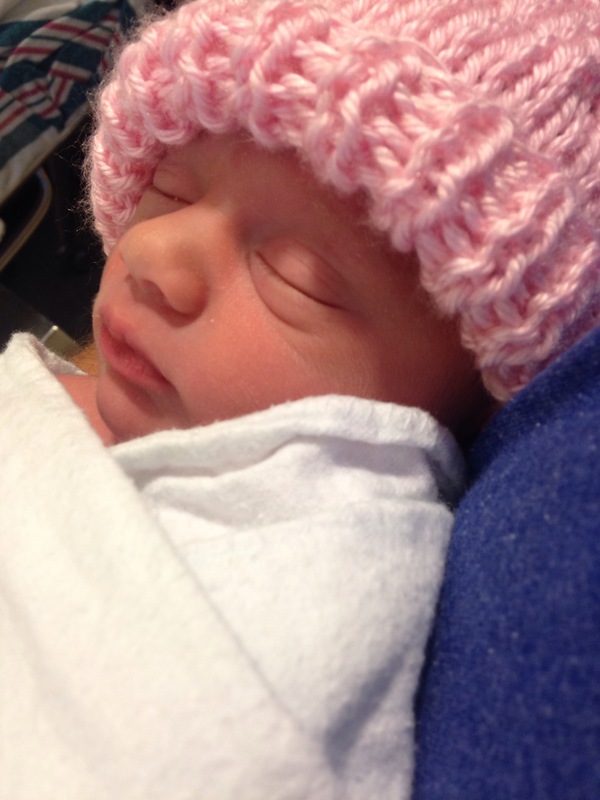 Baby girl is fine but the fear is if Lori’s condition worsens it will endanger the baby. 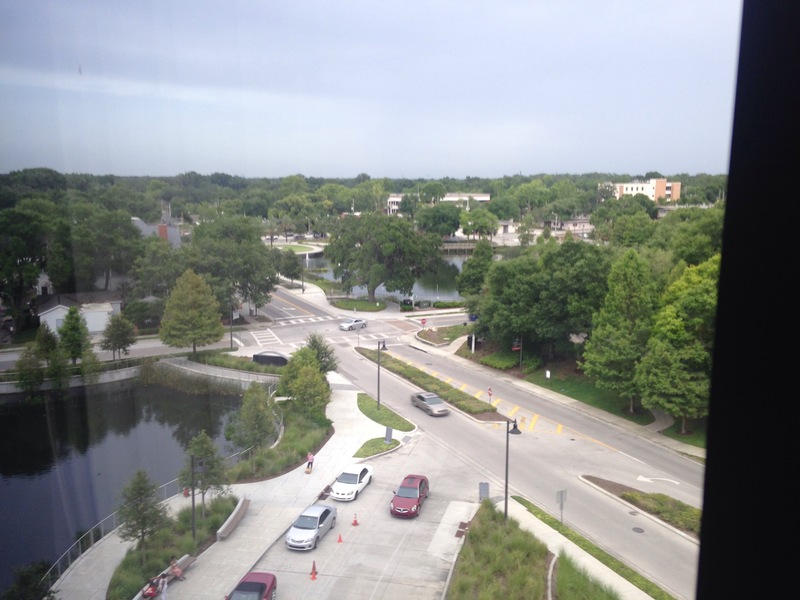 Hospital Room with a view. The food is great and the room comfortable, I even have a Murphy bed to crash on at night. They even have really nice water cups/bottles. This morning as I was working away in the quarter berth Lori called to me. She was laying on the port settee keeping her feet above her heart due to ankle swelling. Her sleeping T shirt was stretched across her amply belly and sure enough things were happening. Baby girl must have been dancing a jig in her belly because it was rocking and rolling as she turned side to side and poked with her feet. Holy smokes, that baby is active. Yesterday afternoon we got to the boat with a relatively small number of parts in a box but a long list of things to do. First thing I tackled was sorting out engine bay wiring a bit. I decided terminal strips were in order to allow for flexibility. Adding a Hobbs (hours) meter to the mix being part of the reasoning. The top strip is energized when the Run switch is thrown in the cockpit this runs the coil, coolant pump (FWC). The second strip is fed from the oil pressure cutoff switch (sourced from the run strip). This runs the fuel pump and hobbs meter. It only gets energized if the motor is turning and there is over 5 psi in the oil galleries. The third strip is just a ground negative battery terminal tied to the engine block. After fiddling with the wire I moved onto working on the engine controls. First installing the throttle and choke cable bracket I made from uni-strut. Nice yellow bracket installed on motor. Here is the finished bracket after a few more adjustments. If you notice in the second photo there is no carburetor, after lining up the cables I removed it for one last cleaning before starting the motor on the boat. After the throttle controls I connected up the shift cable. For the cockpit controls and the backing block for the shift cable under the sole I had to bust out the resin. Smelly, yes, but good for preserving wood in a wet environment. After judicious use of a hole saw and a bit of fitment work the blocks and controls are installed. Yay, controls, It shifts and manipulates the throttle just fine. This is a big deal, the boat did not come with any functional engine controls. Through using the internet and scavenging from the seized up controls that came with the boat we now have a functional setup. With a bit of tweaking we will be good to go. Also this weekend I worked on the fuel system. 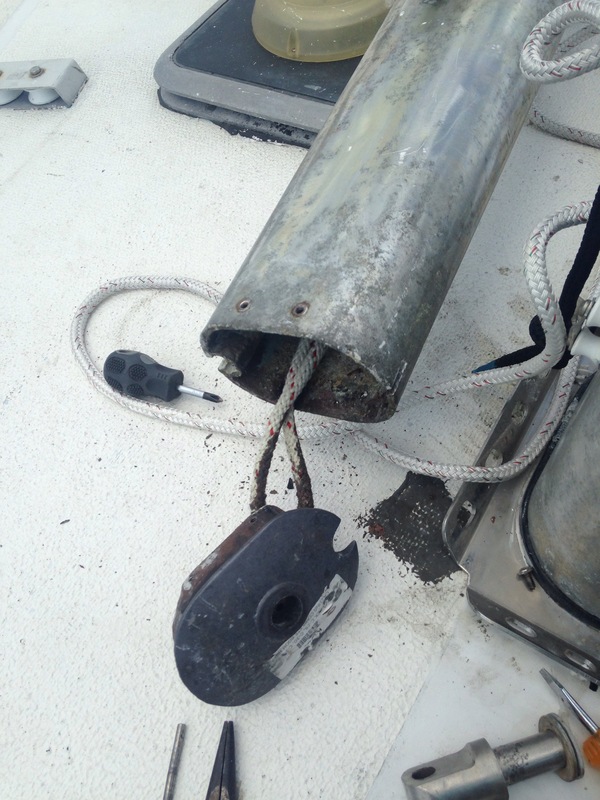 It involved bolting down the fuel tank to the hull and replacing the vent line as well as the thru hull vent. 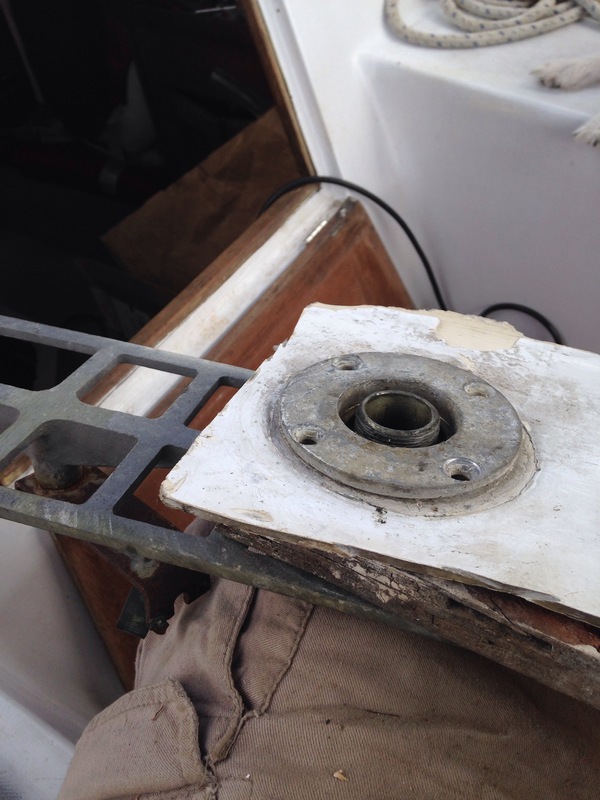 New fuel tank vent on transom. Tank with new vent line. 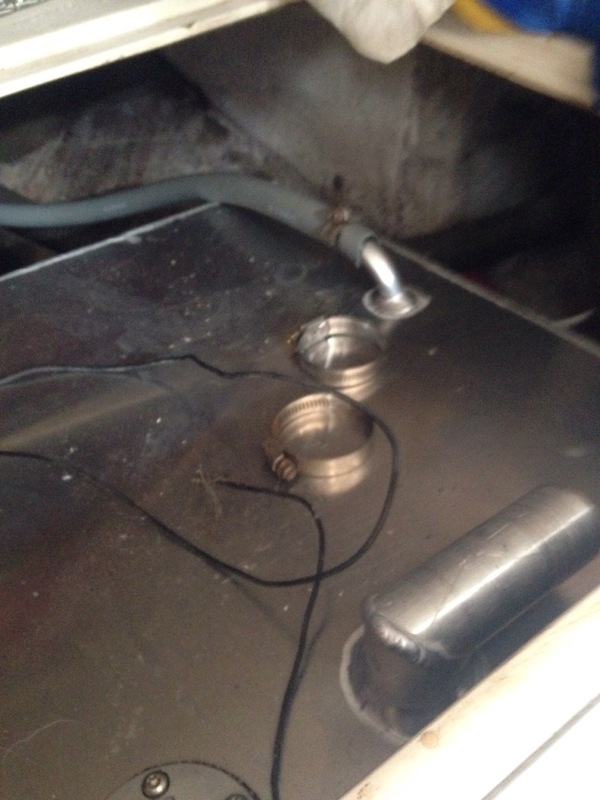 I removed the old too short fuel filler hose and measured it. 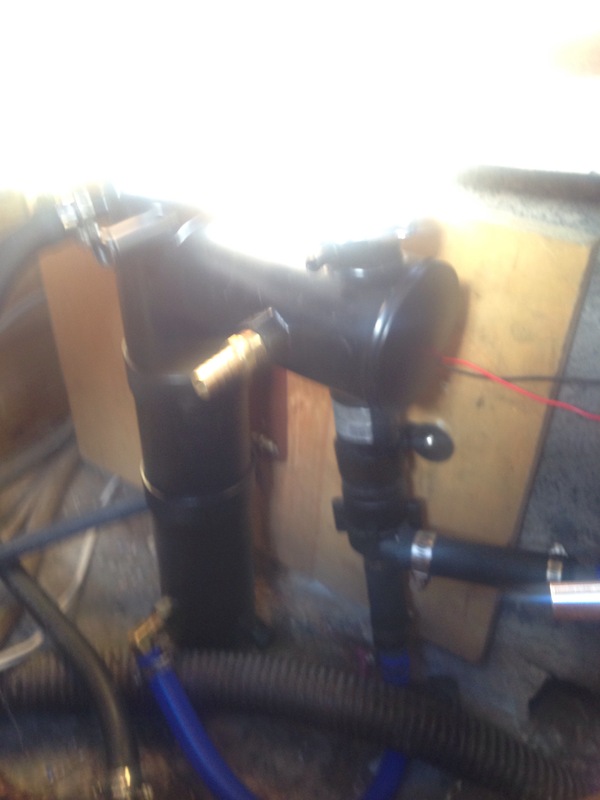 As it is six inches too short to reach the new tank fill I ordered a piece of hose seven feet long (a foot longer than the old filler hose) We will not be able to gas up the boat until this hose is installed. 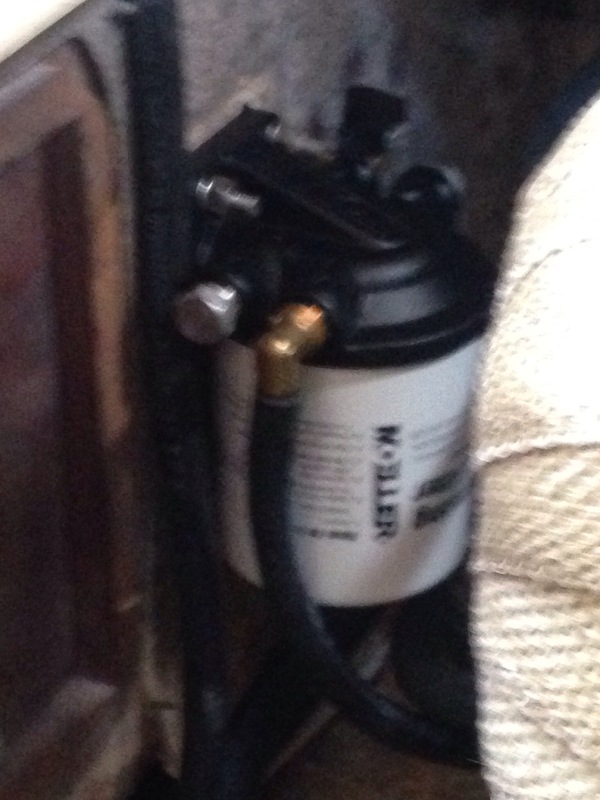 I also installed our primary fuel filter and water separator. We got the start battery installed this weekend. 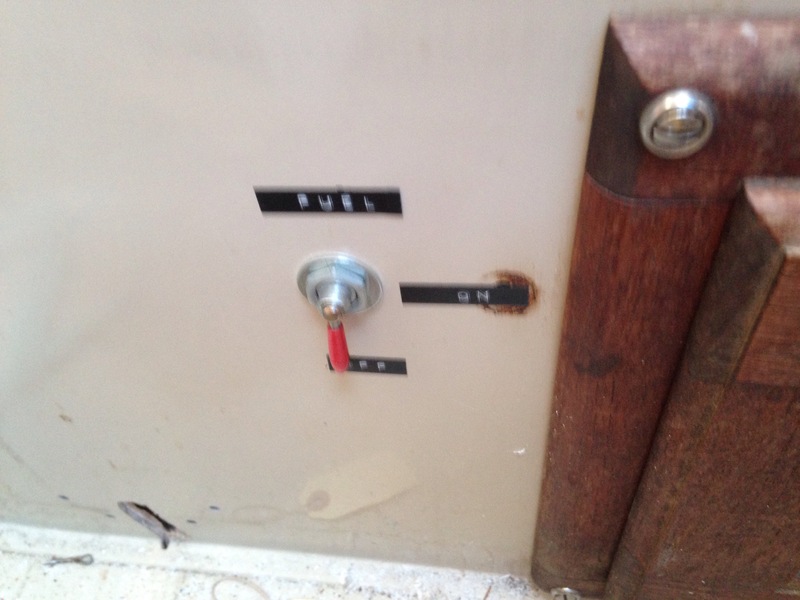 It it is under the quarter berth next to the fuel tank. It is not the best place but space concerns made me compromise on this. 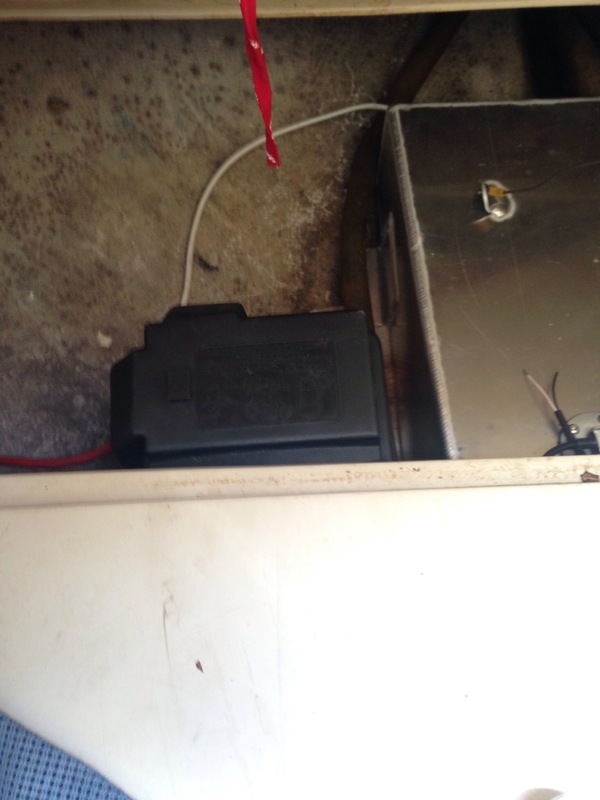 I did put a backer block and strapped the battery box down so it will not move about. 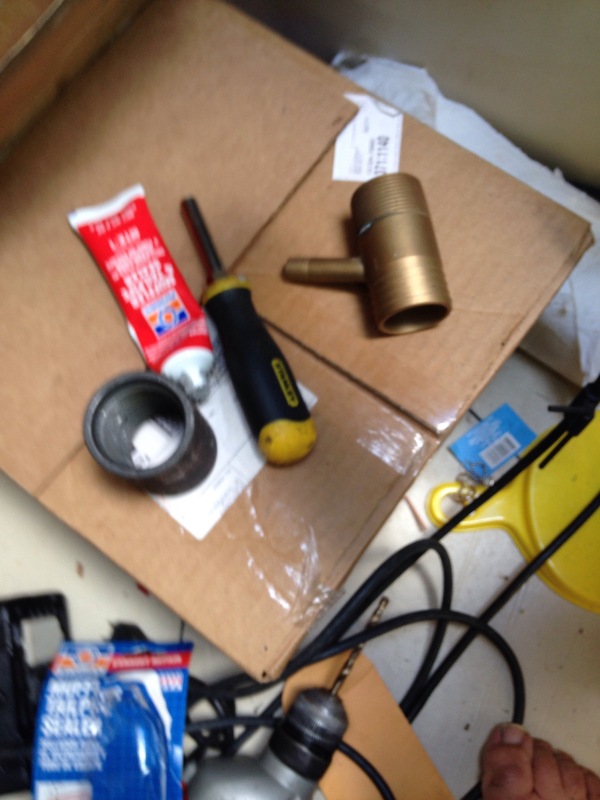 After putting the battery in we (Lori manning the hose and me the manual bilge pump) flushed out the engine block water jacket via the heat exchanger thru the electric coolant pump into the bilge. 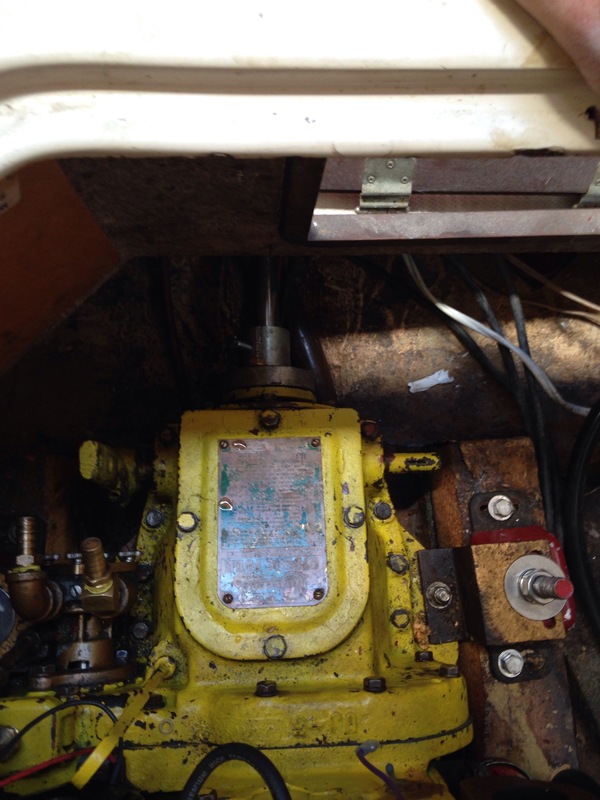 Our dry bilge, taken before the water jacket flush. Once about 10 gallons pumped out of the block we got nice clear water, all the rust and crud left from the machine shop and subsequent work are no longer in the motor. 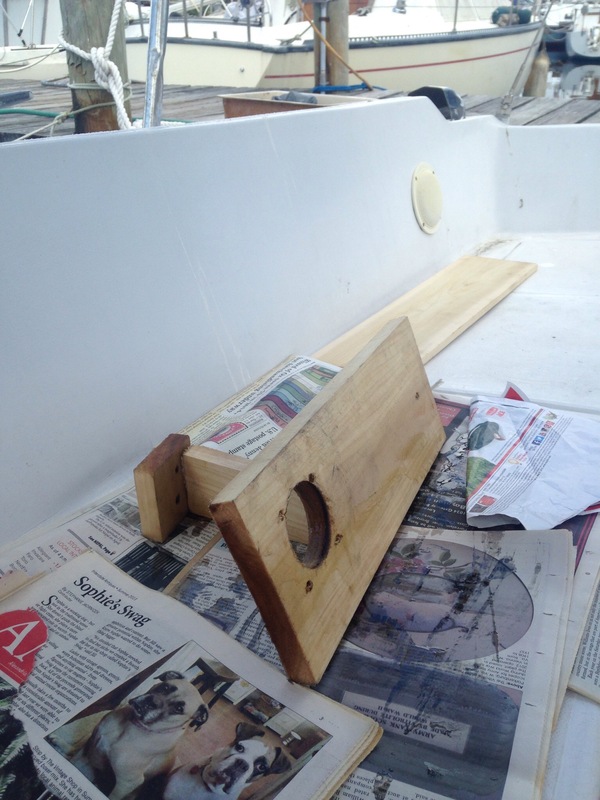 Our automatic bilge pump works great, I also tried my hand on the manual pump. It works fairly well but I do think it could use a rebuild. 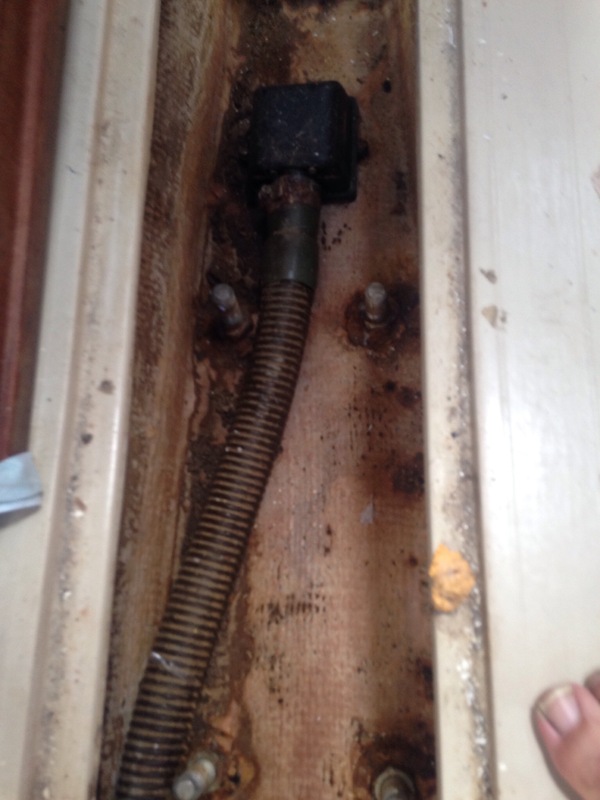 We cleaned the bilge as good as possible to remove all the sediment from years of neglect and our motor flushing. We then filled the heat exchanger with antifreeze, making a point get as much air out of it as possible. Once the heat exchanger was done we tested turning over the motor. Just awesome, Lori and I were both excited…. We need the following parts to be able to start the motor. Raw water strainer- Ordered from Defender, should be here this week. 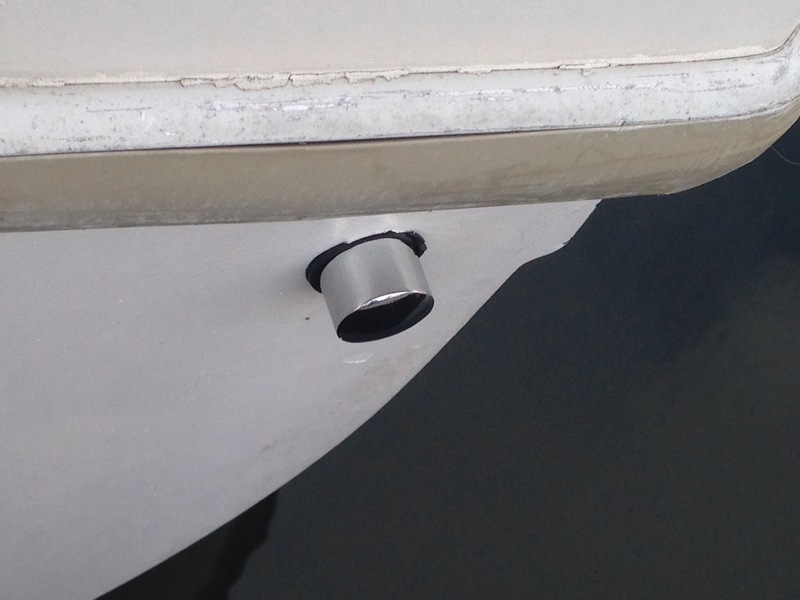 Muffler- I found one online a stainless Moyer Marine muffler and it should be here this week. Fuel Filler hose 7 feet 1.5 inch- Ordered Saturday as Ace did not have it in stock, hope it shows up this week. I also need to clean the carberator and put together all the fuel lines etc, not a bit deal, all the heavy lifting is done. We did a trip out the the Bell this weekend and spent Sunday night under the stars. Feeling a cool breeze on a cloudless night watching the sky scroll past. One thing about the Vberth is you can prop the forward hatch all the way open and then you have a convertible bedroom. Last night in the 70s with a light sea breeze and things were perfect. Lori is a trooper being 7 months along and clambering up into the berth. Thankfully the head on the boat is now functional so no more need for long trips ashore when nature calls at midnight, that would just be too much. We never sleep better than when we are on the boat and last night was a gentle reminder of why we love the boat and miss nights on the hook. Sorry, no photos of this. Our iPhones take pretty poor night photos (probably a way to do it but needs research). I worked on control cables and routing this weekend. Cutting up a piece if angle iron (?) purchased at our local Ace Hardware I re-purposed some of the hold downs from the diesel controls that I had removed from the boat. This bracket will hold the throttle and choke cable so they will properly align with the Carb. I dry fit these and roughly attached the cable and lucky for me everything fit after about three or four configuration attempts. I have brought the entire assembly home and plan on painting it to match with left over motor paint. Also accomplished was using the sawzall to remove the corroded bolts from the cabin sole that hold the throttle cable in position to shift the transmission. New bolts and a backer block now line everything up nicely. 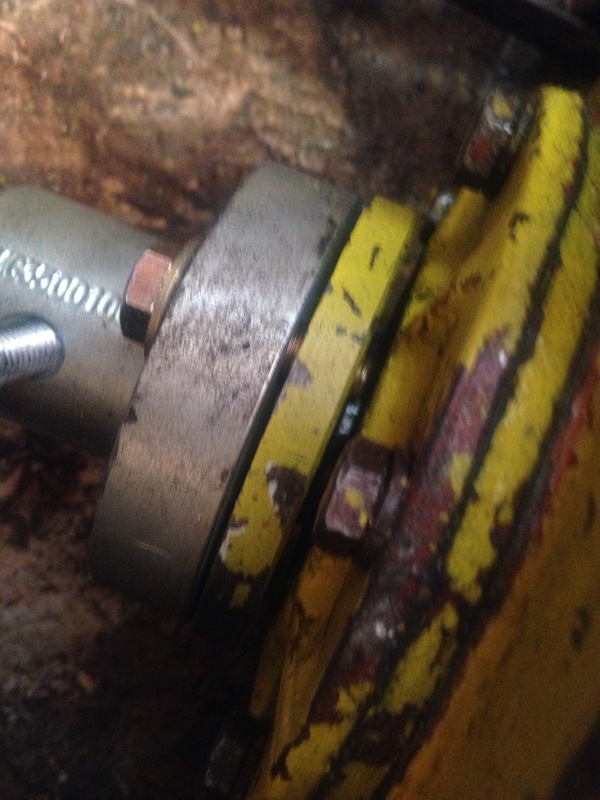 Corroded bolts in the sole next to shaft log access. Now all that is left to do with the controls is the installation of the levers in the cockpit. I fabricated a new backing board for them this weekend as the original plywood was rotten so next weekend I will tackle that task. Last week I had ordered new iron pipe from McMaster Carr to make an exhaust riser. My new water injection port from Moyer Marine. New pipe installed waiting for heat wrap. After getting the pipe fitted to the motor I started to line it up with the water lift muffler. After removing a small fragment of exhaust hose from the inlet port I discovered it had a 2″ port not the 1.5″ port I need to match my exhaust manifold or the 1.5″ exit port on the same muffler. I just assumed inputs and outputs would match. Scratch one muffler, it will not work and a new one has been ordered. If the water lift that came with the boat had worked I would now be done with exhaust work, oh well. After the muffler I installed an overflow tank for the cooling system. We are now done with the cooling system except for the 2 missing parts, a anti-siphon loop and a raw water strainer. Both have been ordered and are int he mail. 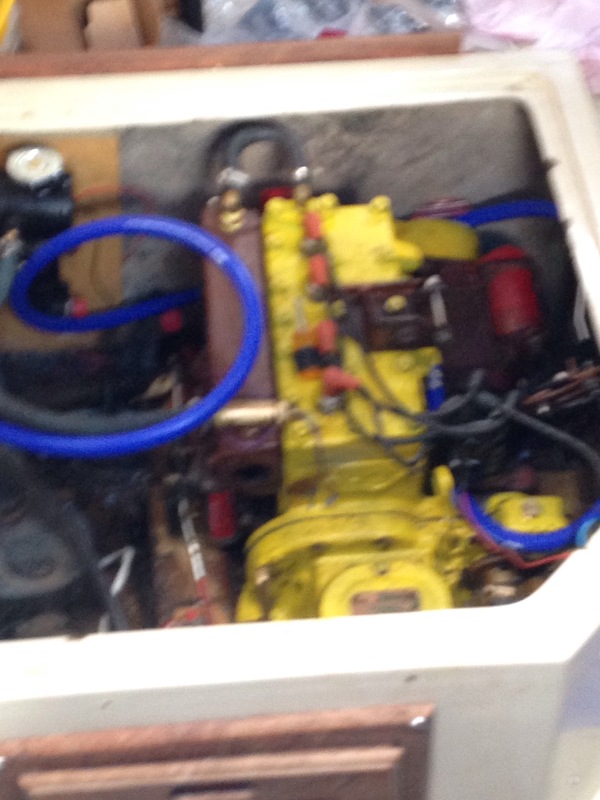 I started on installation of the fuel system, putting a shutoff valve in the galley. Even with old school clicker labeling. I will be mounting the filter/water separator below it in the engine compartment. I also replaced the “DIESEL” labeled 1.5″ deck fill with a new one properly labeled “Gas” since now we will be burning petroleum. 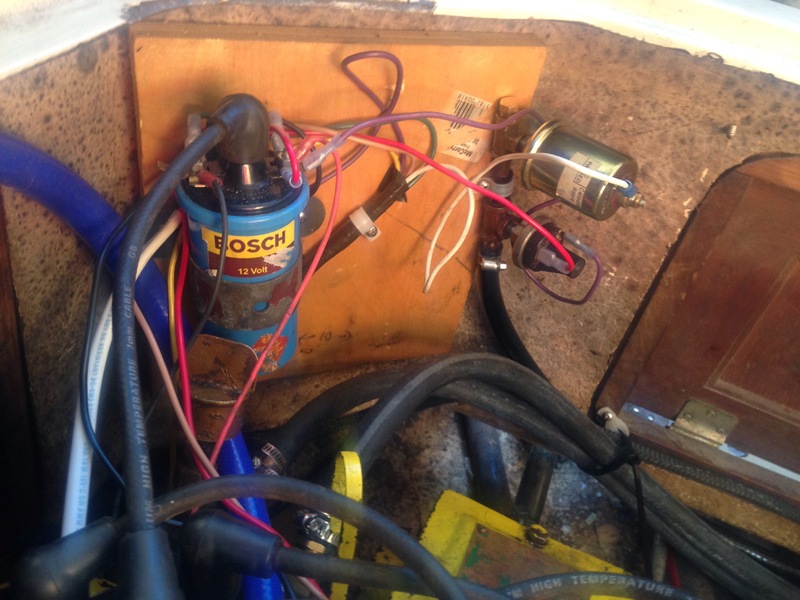 Another task I accomplished this weekend is I wired up the engine control panel and blower into ships power. You can now energize the panel, turn on the blower, turn on the ignition and hear the fresh water cooling pump start to work. 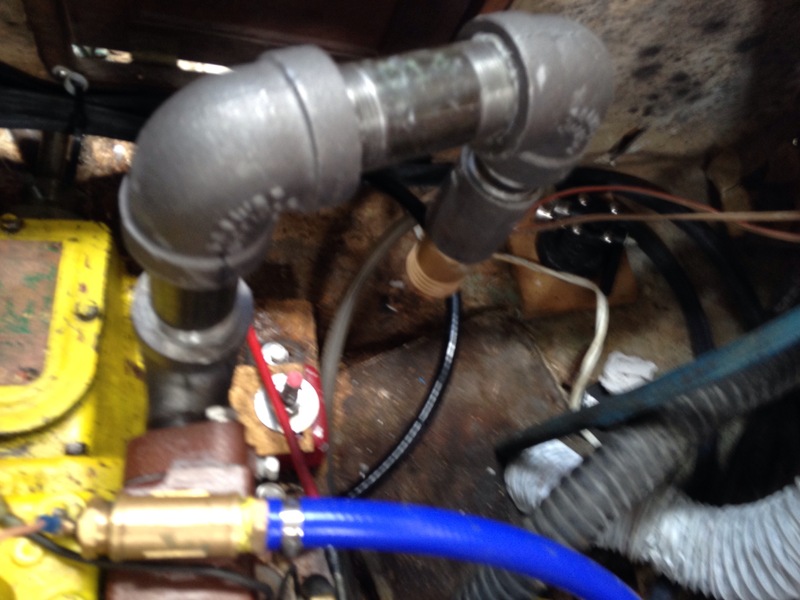 Blower hose to the bilge, it works, you can feel the exhaust coming out the vent topside. Also visible in the above photo is the wrapped exhaust, failed black water lift muffler, finished raw water lines. On top of the motor is a small secondary fuel filter to go between the fuel pump and carburetor. We were hoping to finish things off next week. A short list of what is left to do. When I went to Navy boot they had a thing about attention to detail. Going on about how pilots have died because technicians installed a split pin in the wrong orientation. I remember having to do drills and push ups without end to drive this point home. With the Lori Bell I am attempting to catch and rectify the details, before they become and issue. 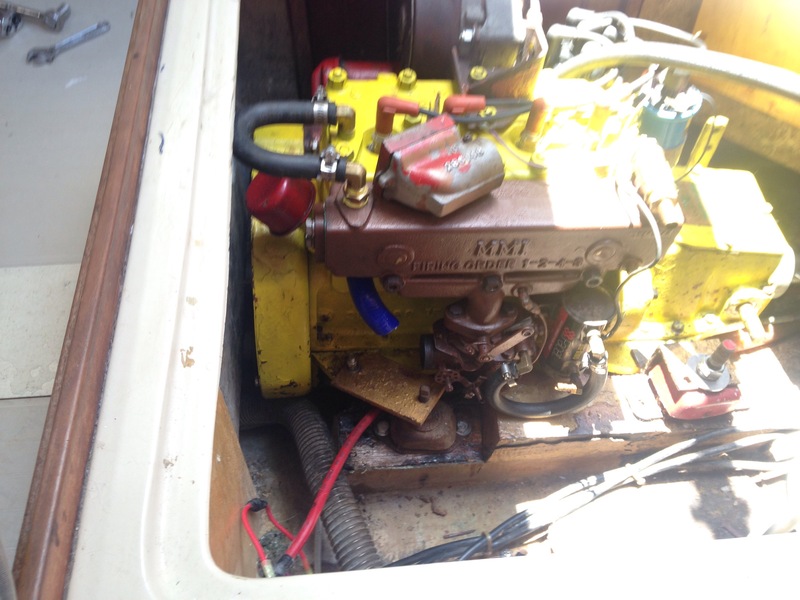 To set the stage for those who have not read my blog post from a few years back you need to realize that this boat came to use with no inboard engine, no wire harness, no functional control, just and empty engine compartment. All those devilish details fall squarely on my shoulders. 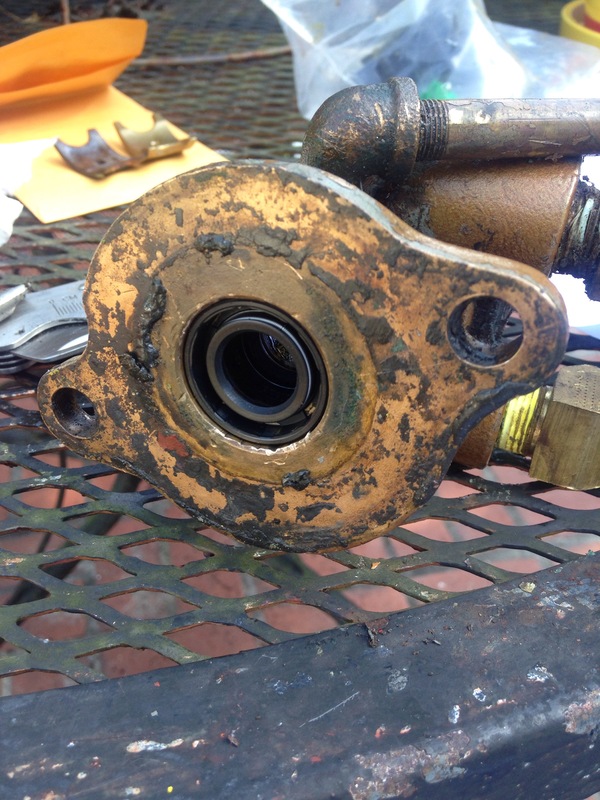 On my previous trip out I had pulled the raw water pump. It had a slight weep of water from the weep hole. Last week I rebuilt it sitting at the patio table with a kit from Moyer Marine. Interestingly enough the old seals, unlike the new rubber jobs were pressed in brass rings with a rubber insert. This it appears the old ones caused some scoring of the shaft and thus the leak. 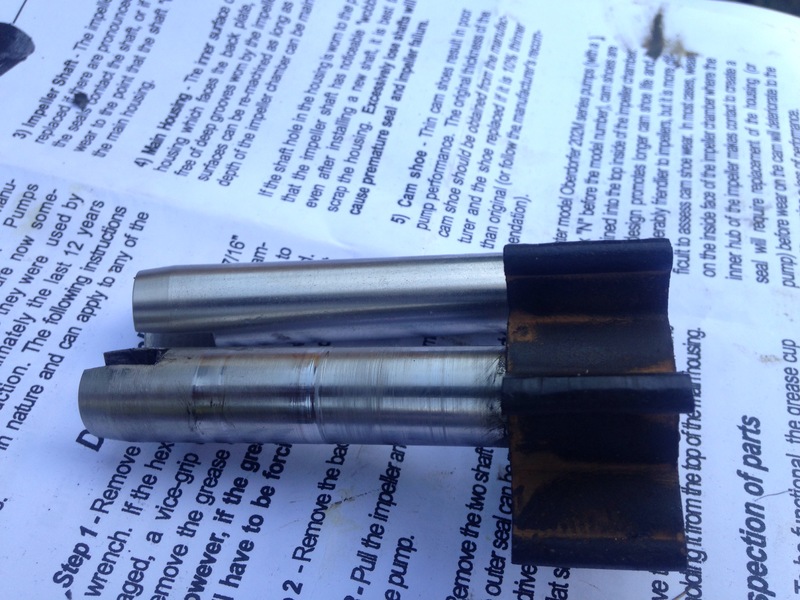 Old shaft and new shaft, note the scoring on the old. 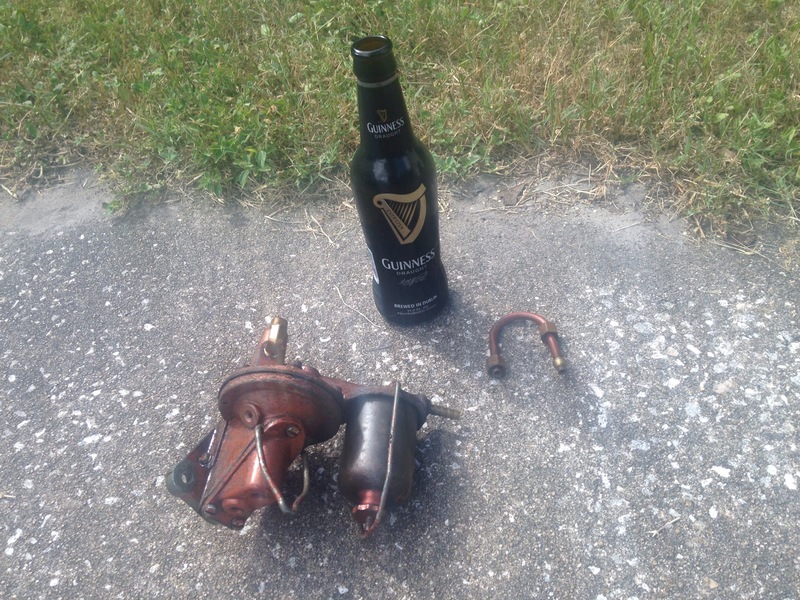 I also endeavored to prep some of the exhaust pipes that came with our motor for installation. I did this using and old fashion hammer the pipes to get them loose technique. I was successful in getting one of them to loosen up and I did try both in the boat last weekend. However, I was unhappy with the fitment and the alignment of the water injection so I ordered new pipe from McMaster Carr this morning and Moyer Marines purpose built exhaust water injector. So I spent last weekend at the boat. Lori did not accompany me as it is not the most comfortable place to be as the cabin is torn asunder and she is in a family way. The first task I undertook was to install the water pump. I had noted that it was rubbing on the starboard rear engine bracket so I trimmed that before putting the pump back in. After the pump was installed I worked on aligning the motor with the shaft. It was close but not quite perfect. I had a few bolts loose but was having issues getting that last fraction of an inch. I was getting aggravated as the motor is very heavy and it just would not go. 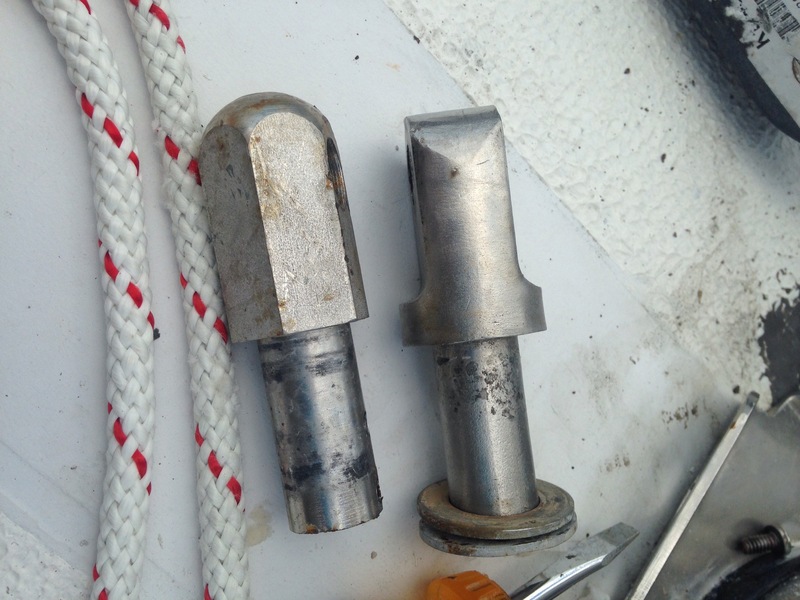 As I contemplated more drastic action involving cutting the starboard rail/bunk I took out all the bolt attaching the mounts to the bunk. 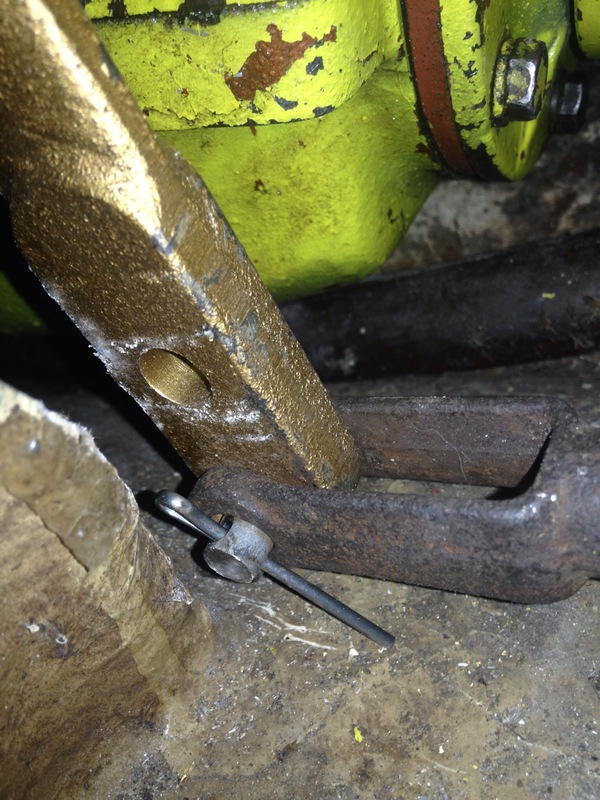 On a lark I jammed my trusty hammer between the bunk and accessory drive hump and gave using it as a lever lifted the rear of the 450lb motor about an inch. When it dropped back down it was perfectly aligned. Good enough I said and bolted everything down nice and snug. Then rotating the shaft by hand I aligned the bolt hole and attached the motor to the propeller shaft. Shaft and coupler together at last. Finished. The rebuilt raw water pump can be seen to the left of the transmission. After taking the victory photo above I proceeded to rough in the cooling line. Black lines are for raw (ocean) water, blue is for the antifeeze cooling loop. With the cooling hose roughed in I decided to take a lunch. I loaded the pups in the car an of to Burger King we went. 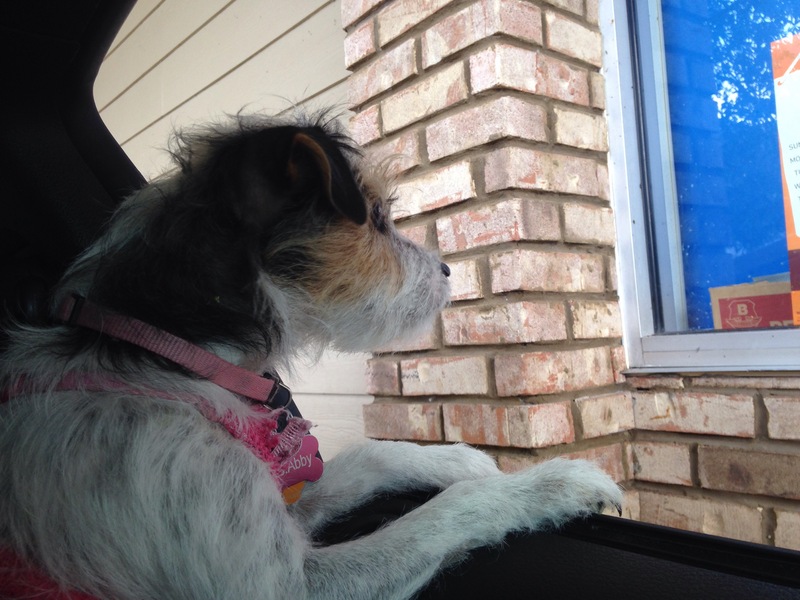 Abby likes drive thru dining. After lunch I went to work on installing the control cable. Before coming out to the boat I had finally got around to testing their functionality in the driveway. Lucky for me I received no lacerations and they worked properly, sliding with ease. An interesting note is that the control head did not come with knobs. 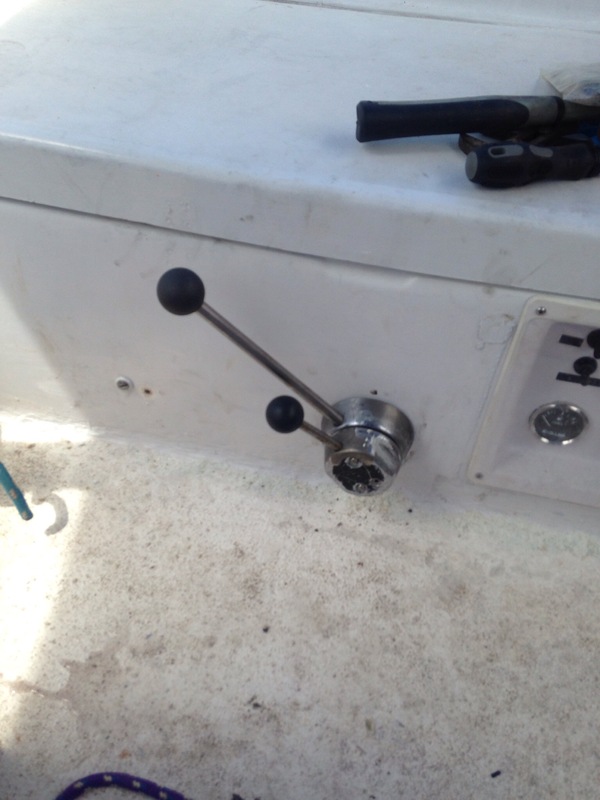 I was fortunate in that the knobs that came with the boat (diesel control) fit perfectly. The actual assembly although similar is different in every other dimension as the Atomic 4 controls are heavy due to clunky shifting. To retrieve the big lever from the old controls I had soaked it with PB Blaster for the past few months, it would not budge. In the end I took a hammer to the old controls and shattered the casting to facilitate removal. To install the cables I had to dive into the port sail locker and feed them thru. Then I worked them forward to the engine bay. 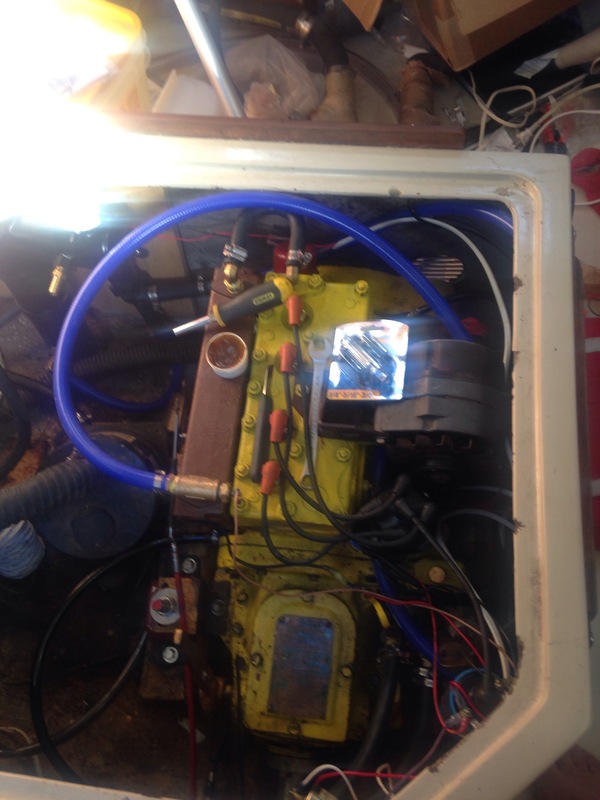 At the same time I fed the wire harness forward into the engine compartment as well since had it coiled up behind the galley cabinet since installing the panel. Taking apart the salvaged controls for install. After getting the cables roughly placed I turned to installing the controls in the cockpit. I had to remove the remains of the old controls and install the new. This is when I came to realize the physical difference in the two sets. The new controls did not want to come apart for installation. I spent the remainder of the afternoon pounding, prying and twisting them but to no avail. They were corroded together. After calling it a day I took the new controls home and applies a health portion of PB Blaster to the seem in question. Lucky for me I had already moved it a fraction of an inch in pounding on it so the PB could capillary in and the parts came apart Sunday morning. I also sprayed the cable hold downs that were seized up and they to were no longer seized in the morning. Sunday morning after a trip to Ace Hardware I made my way out to the boat again. Having tired of fiddling with the controls for the time being I decided to work on the cooling system again. I plumbed in the fresh water pump and lines as well as most of the raw water lines. With the heat exchanger and pump on the forward bulkhead of the engine compartment. Heat exchanger and FWC pump below. Note the pump has 3/4 outlets that I had to adapt to 1/2 hose. In the end this setup will be using roughly 10 feet of 1/2″ blue hose for the fresh loop and 16 feet of 1/2″ black hose for the raw loop. 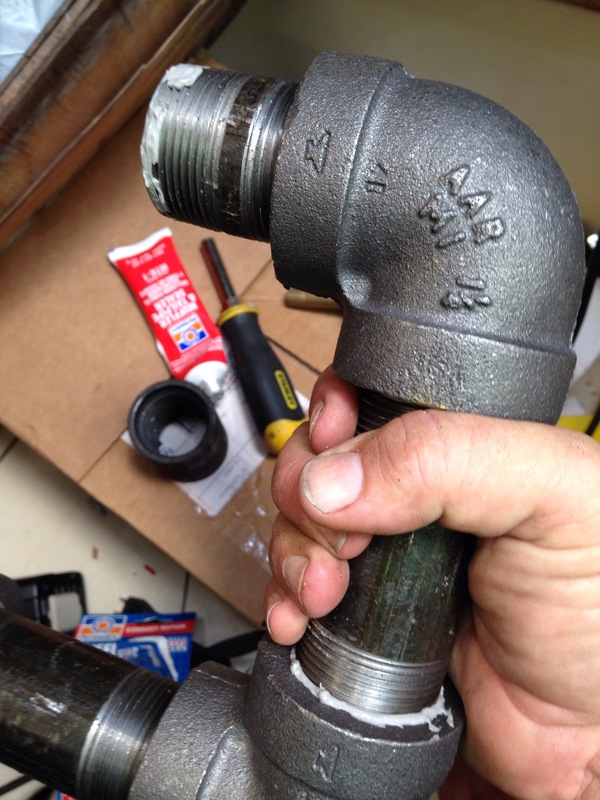 12″ of 3/4″ hose for the adaption of the pump. Of note is that the raw water strainer I had on hand did not fit as it had a 5/8″ barb ( I think) and I really did not like its function (hard to open). I have ordered a Jabsco strainer with the proper 1/2″ barbs that has good reviews, hope it works out. 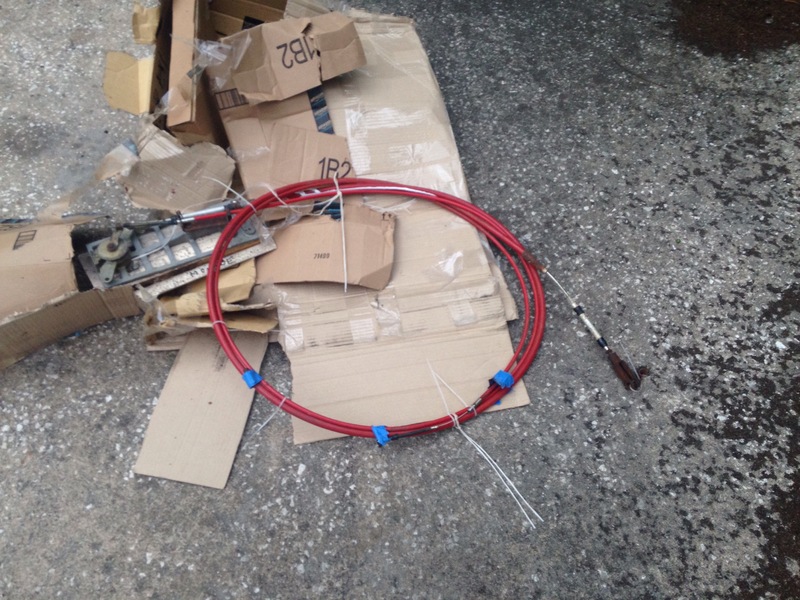 Also ordered was an anti-siphon loop for the exhaust raw water. After getting as much of the cooling system sorted as possible I started to look at the electrical. After taking an inventory of electrical parts on hand I decided it was a good time for lunch and another trip to Ace Hardware. After a Ruben from Arbys I did some shopping. Ace Hardware here in Titusville is outstanding for boat stuff, they have a selection rivaling West Marine. I then proceeded to start to sort out the electrical wiring on the Bell. We have already done some work at this but I had not worked that much on the distribution to the engine bay etc. She had 3 black #4 AWG wires I assumed were grounds (negative) run into the bay laying loose and 1 red #2 + wire. 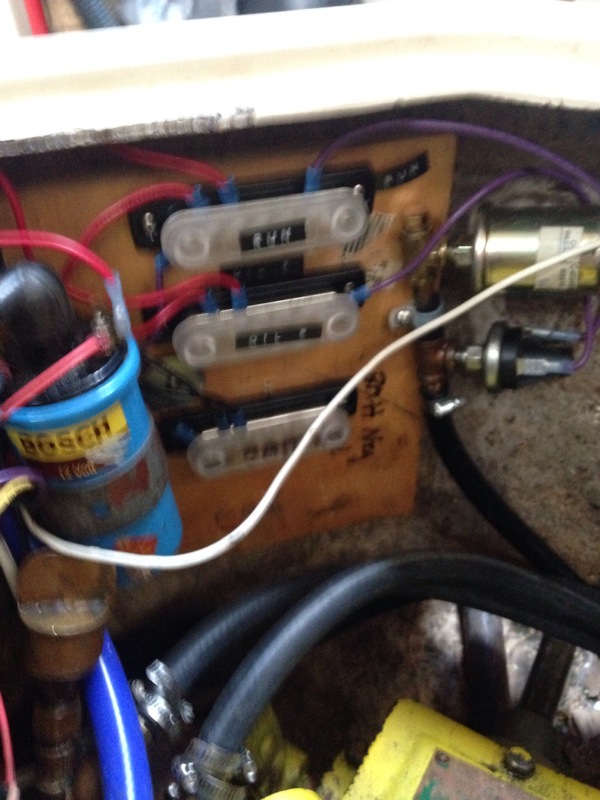 I had been using one of the – and the + to power the bilge pump on the starter battery position of our battery selector switch. This makes sense as the red #2 will be connected from starter battery to the starter (its pretty heavy). I was surprised to find that one of the black – wires was actually a + tied back to the common post on our selector switch. I had wrapped the end in tape just to be safe over a year ago as not to have loose wires adrift, I just never checked it. I discovered it was a live wire as I was inspecting the crimp ends to determine which of the three to keep. I inadvertently touched it to another – wire and got a nice pop as a reward. Oh my. I removed 2 of the extra – wires (one actually +) and re-terminating the ends with proper marine crimps and applying no-ox etc. I also ran a new #2 to were the start battery will be placed near the fuel tank. Also removed from the boat were 2 lead automotive battery lugs that did not make the cut as I cleaned up the house bank cabling. For crimping I used this tool. A great investment and crimping with a hammer is always fun. After sorting the power distribution I finished off the day wiring in the engine harness in. Harness on aft bulkhead. Note oil pressure sensors, ignition coil and raw water lines from the mechanical pump. 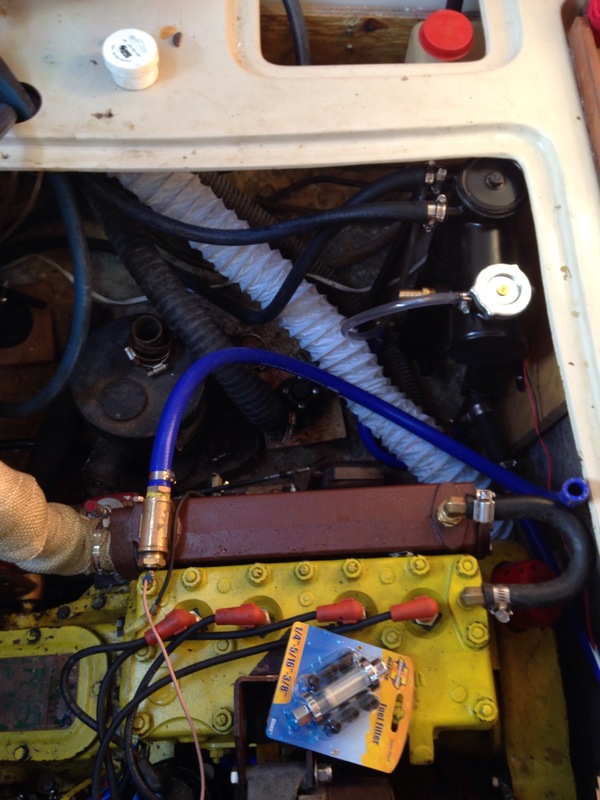 In putting in the harness I also installed the oil sensors remotely, instead of directly to the motor I installed a hose barb and ran the hose to aft bulkhead. This way I can keep the sensors away from engine vibration, cooler and keep the wiring as compact as possible. I built the harness using fire retardant black loom, it works as it protects from chafe and keeps things tidy. Here is a view of the entire mess at the end of the day. Note the long blue hose in the above photo. 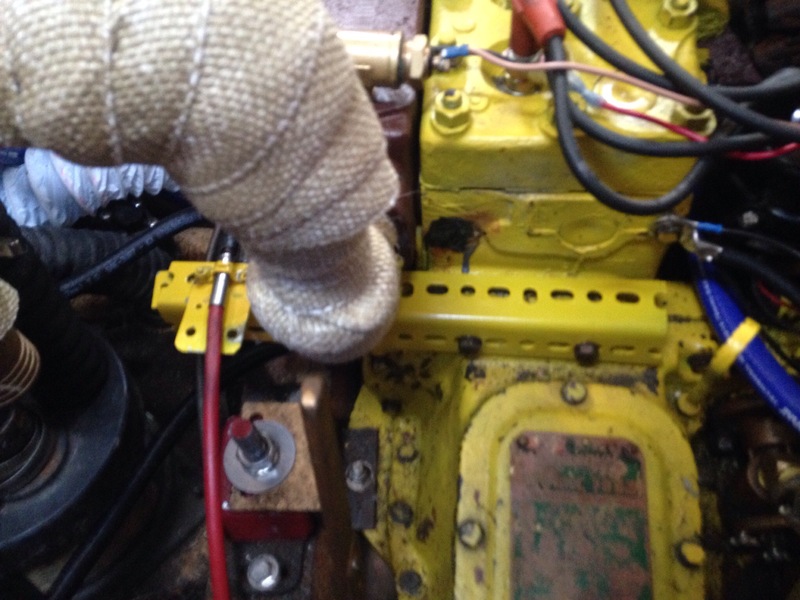 I plan to flush the motor a bit with fresh water before filling the jacket with antifreeze, this hose will allow the water to flow out of the manifold and into the bilge to be pumped overboard. I will cut it to length when done and install it on that vacant hose barb at the top right of the exchanger. One good thing about an electric cooling pump is I can run it with the motor off so not have an overheating concern. i have decided that since I have so many odd bits about I wi try and part with a few. But before they go I am adding a new feature to the blog. What zit? Can you guess what the photo is of? Guinness supplied for scale. Here I go attempting to compose a post on my Galaxy Tab using a blue tooth keyboard. Bear with me here as i have no auto correct or spell checker. 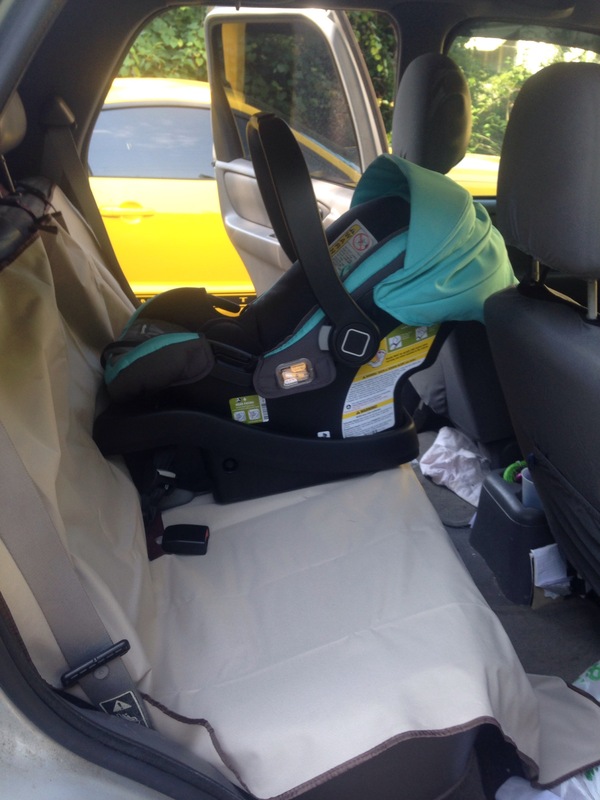 Yesterday we received our stroller car seat combo in the mail. I took it on myself to install the seat base this morning before Lori departed to her Mother, Daughter banquet with her mom. Here it is, note the dog slobber pad on the seat. 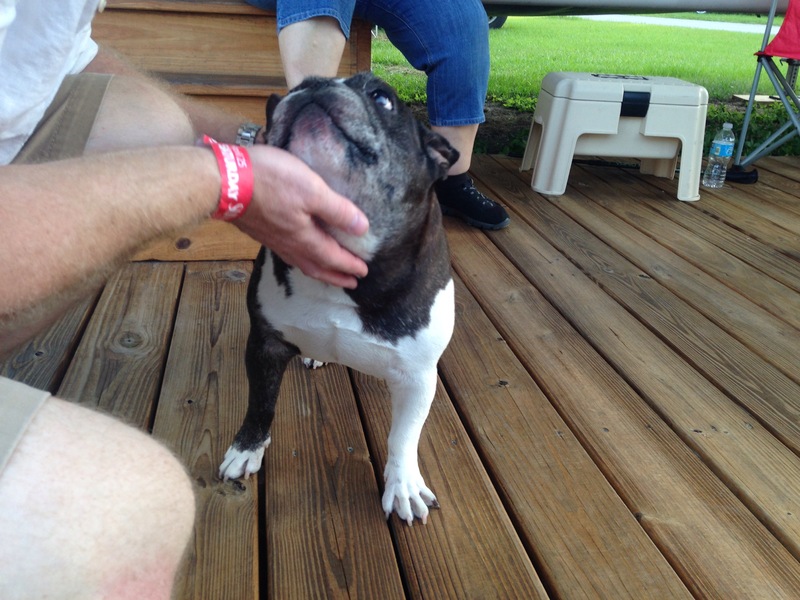 Poor Lucky has a nervous condition that causes him to drool uncontrollably every time he sets foot in a car. The pad keeps the slobber in his towel and off the seat. After Lori departed for her event I wrangled up the pups and headed for the boat. 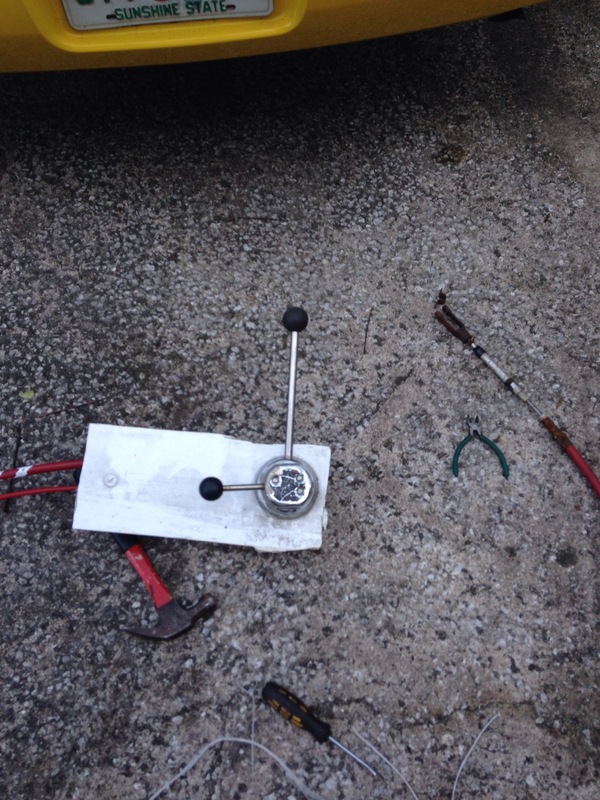 First task on arrival was replacing the incorrect clevis pins on the split back stay. The rig still needs tuning but i have eliminated the fear of imminent collapse that has haunted me. Fixed, new clevis and split pin. After getting the back stay in better shape I proceeded to move on to fixing the boom, as I need it in place to lift the engine for shimming the alignment with the propeller shaft. I still have the old pin from the fractured boom end, good thing I kept it since it is thinner than the new one that does not fit the old goose neck. Old pin to the right, new to the left. Boom end removed to replace pin. Of note is I used ample amounts of anti seize on both the screws and the casting. It worked because I was able to remove the screws and casting with little effort. Win. 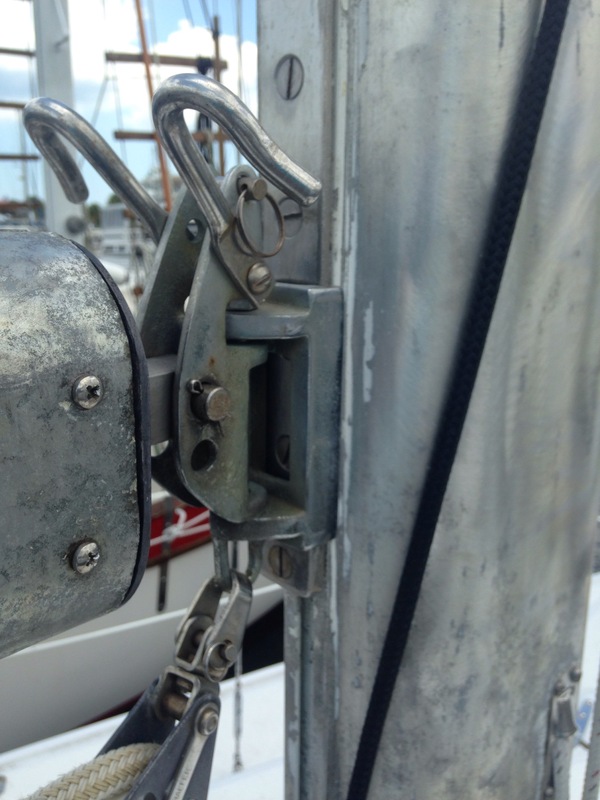 It is interesting that the entire boom is basically attached to the mast by one split pin. Of course the physics allow this. Goose neck attached to mast. finally. 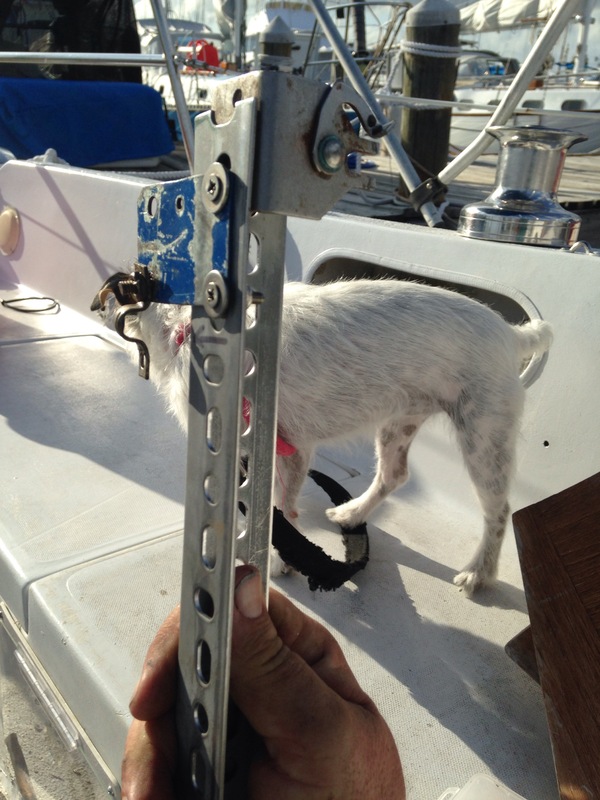 After attaching the boom I had to rig a topping lift to keep it off the bimini. 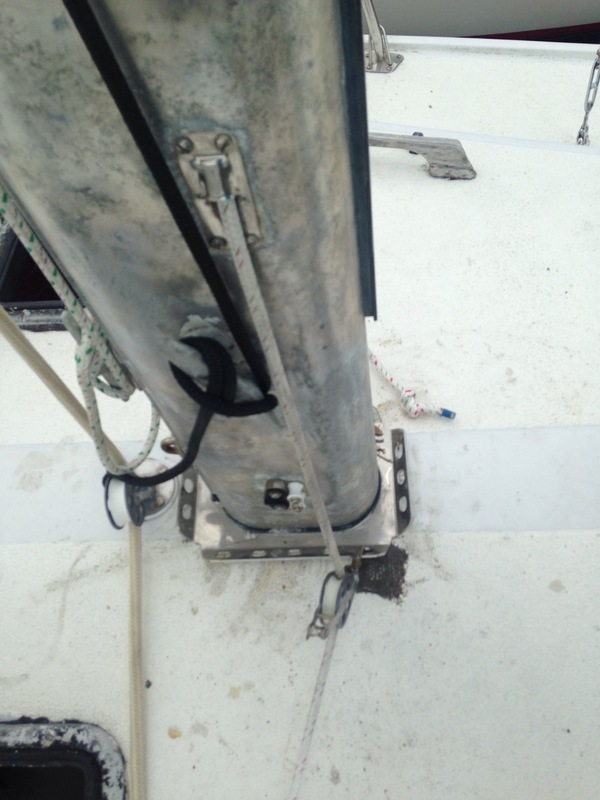 I had decided to use the secondary halyard as the topping lift as it can be adjusted at the base of the mast. As luck would have it the black secondary is in fact too short to act as a topping lift. 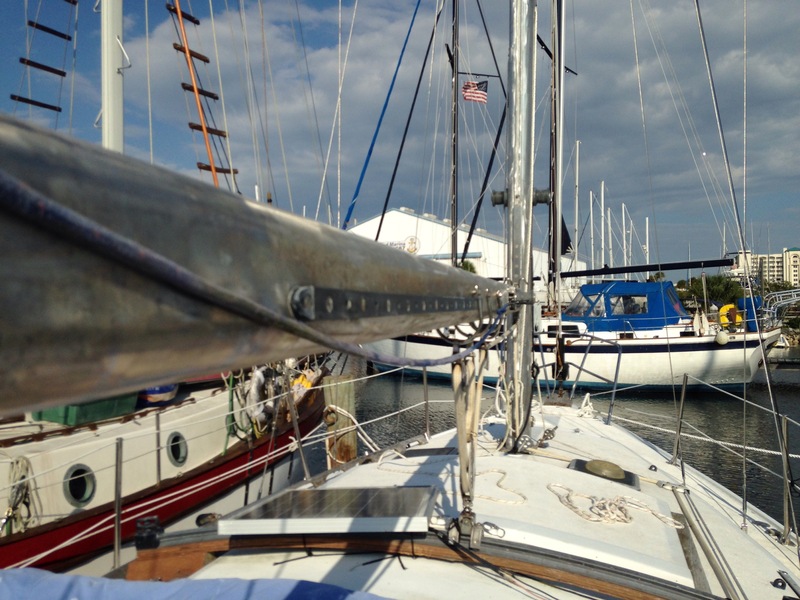 For now I have the primary halyard as the topping lift as it is longer (runs back to the cockpit). 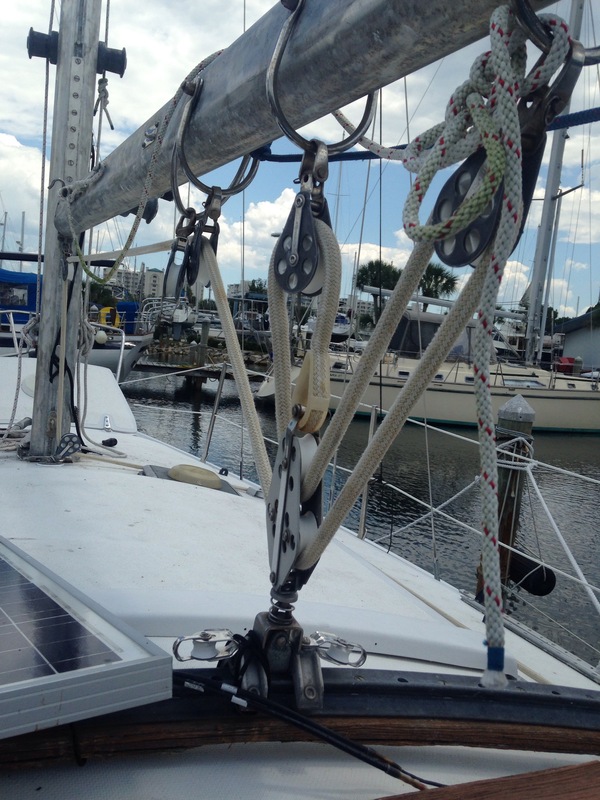 I may just put a short extension on the other halyard instead of buying a new longer line. I have yet to decide. Once the topping lift was installed the boom started to swing about and to secure it I needed to install the main sheet. 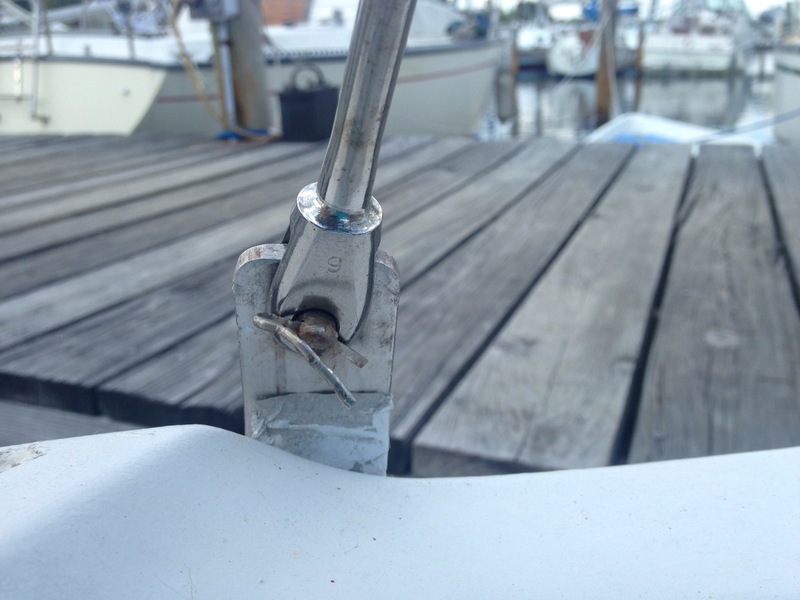 I dug the sheet out of the sail locker and proceeded to thread it through all the blocks. Main Sheet rigged to the traveler, 6-1 purchase. Of course there was a lot of slack in the cockpit with the boom sheeted in, I still need to rig the traveler. And of course closer examination reveals it is frayed. Note to self: Replace. 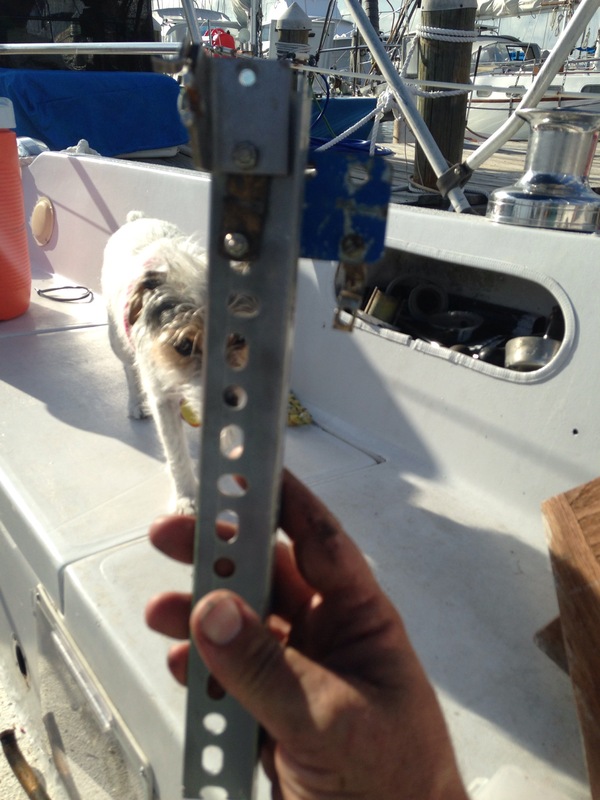 Of note is I removed a fair lead from the deck and replaced it with a block to the mast plate. Here is a photo of it in action. I have a better block for the job but need to locate it and the cabin is in a bit of disarray. The gray spot is an epoxy repair to the holes for the old fair lead. Now I can move on to engine work. Here she is.. Our motor, Woodstock. 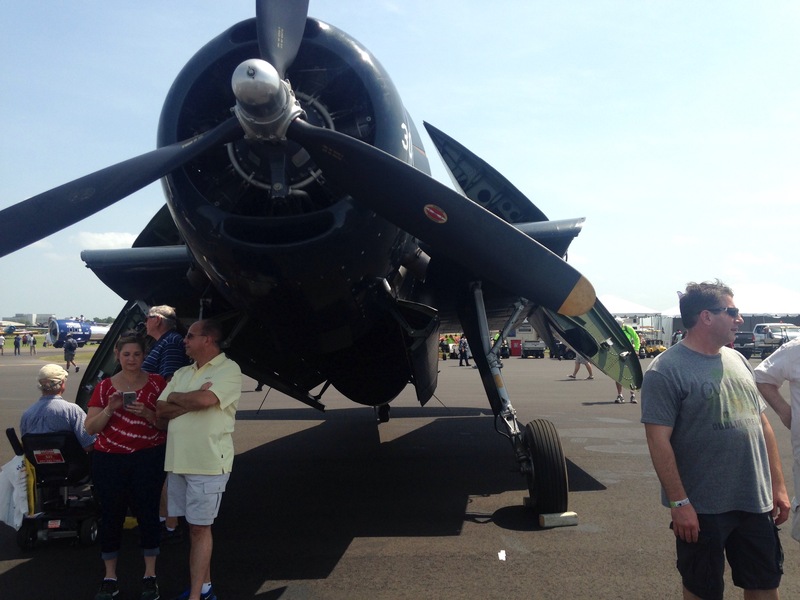 First I had to get the angle of attack of the motor and the propeller shaft to line up. I did this by rigging a block to the boom and using the secondary halyard (extended with some scrap rope) to lift the front end. Spare block, used to lift motor. 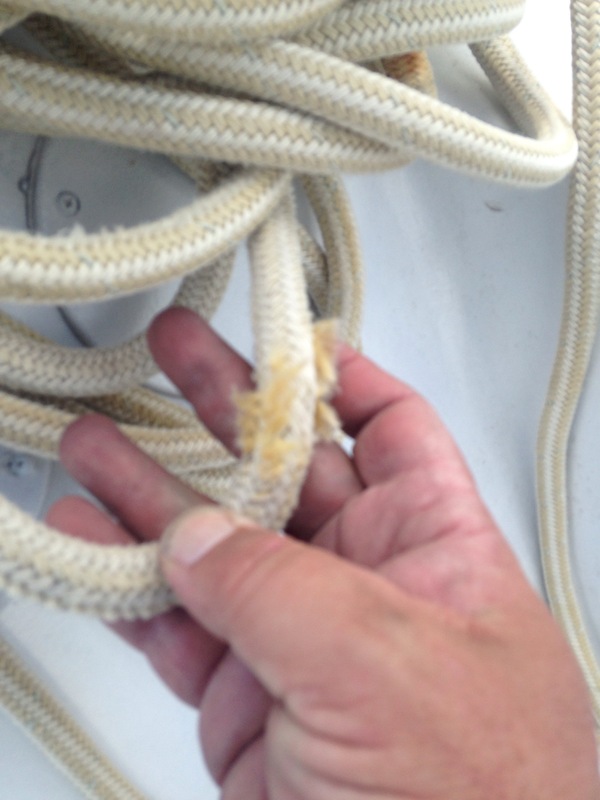 I put enough extra line on the halyard that it would be able to reach the winch on the mast. I really like these winches as the Clew did not have them and I find myself using them quite often. 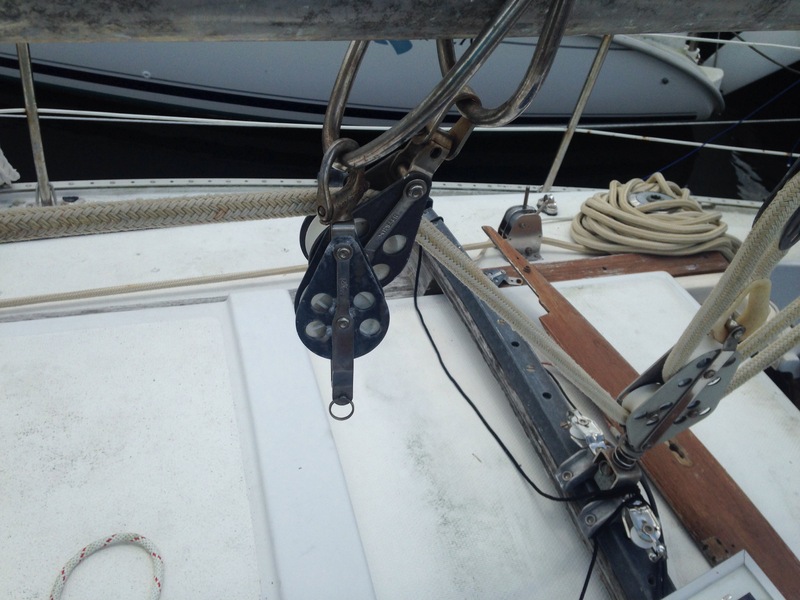 I tied a large loop around the fly wheel housing using a bowline knot and put a lot of tension on the halyard. I did not really lift the motor per say but the gave me enough assistance that I could lift and move the motor about pretty easily. I shimmed the front motor mounts using shim that were left when the last motor was removed by the previous owner, glad I kept them. now have the shaft and motor sitting at the same angle. I then removed the alternator and water pump from the motor. I have 3 alternators and plan on taking them to a local shop for testing, I will install the one they say works best. The water pump has a weep from the weep hole so I plan on rebuilding it here at home using a kit from Moyer Marine and reinstalling in time to start the motor. 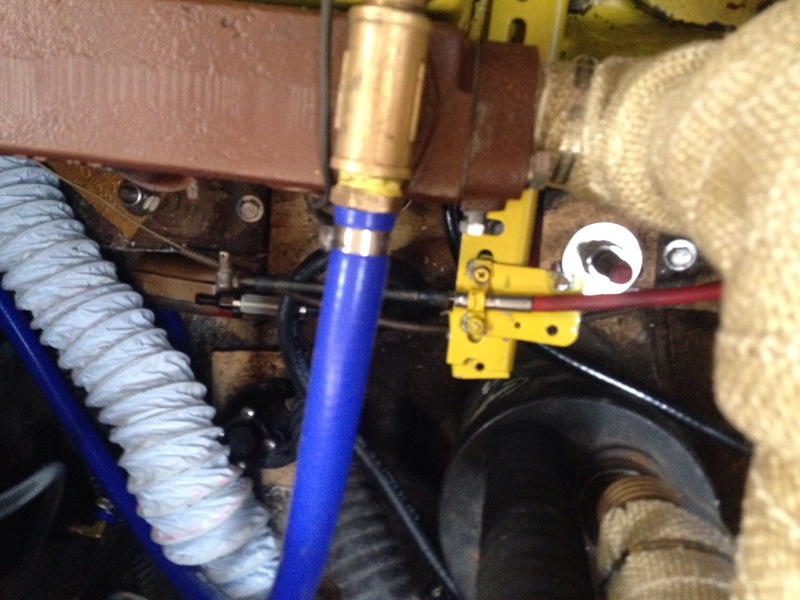 Also performed in engine bay is I moved the coil to the aft bulkhead, away from the heat and vibration of the motor. Not a big deal but since I have the space why not. I also installed the heat exchanger and electric fresh water pump on the forward bulkhead. It fit nicely. With easy access to the fill cap. I still have a lot to do, but at least I can say the work has started. I look forward to having the Bell move under her own power again. 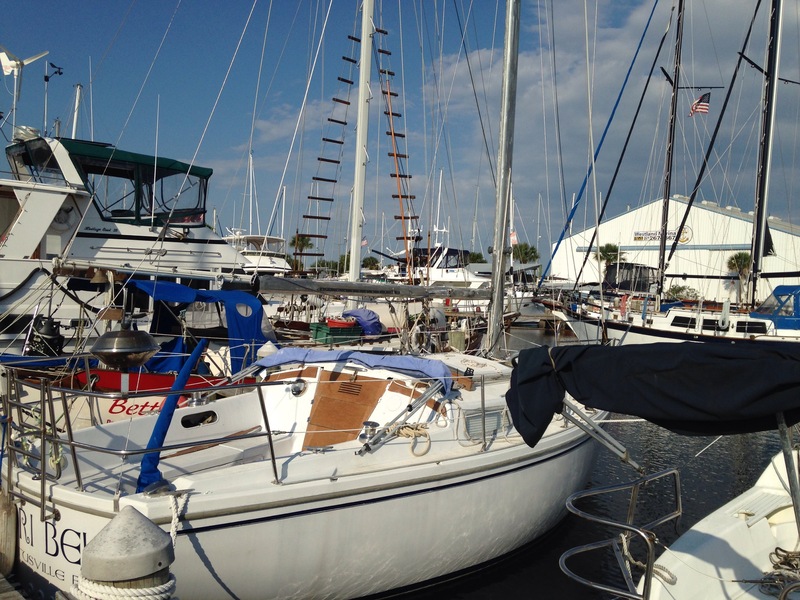 Packed up with the bimini stowed, until next visit. I have had a bit of time to think about the order of operations to get the motor in order and the Bell underway. Here it is what I will be doing next. Align the motor with the shaft- I have a rough plan on lifting the front of the motor using a 4×4, floor jack, rope and ladder. Not bad, but a decent list. Yesterday I got home from work and decided to be industrious and clean up a bit. 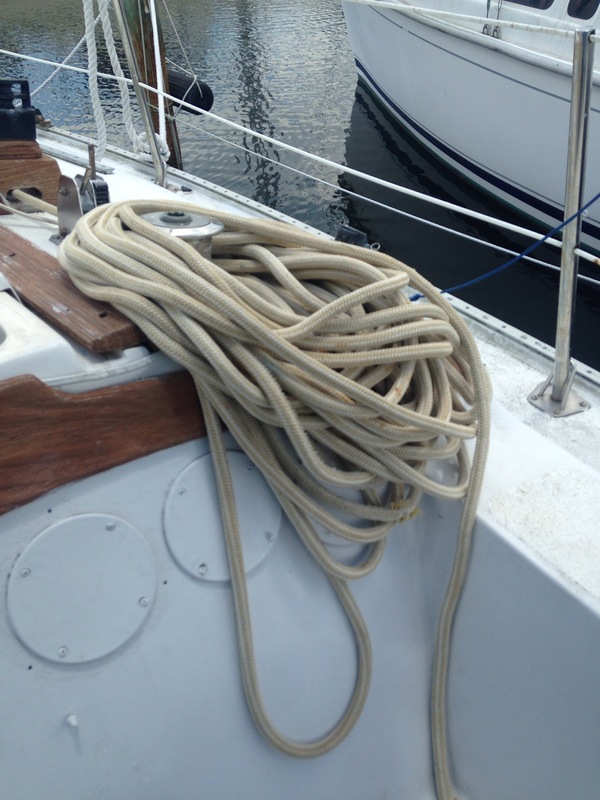 I wanted to sneak in a little boat work and as cleaning included pulling out my salvaged control cables I had purchased from Catalina Outfitters. (Found thru the Catalina 30 facebook forum) I thought I could lube them and get a feel to the condition of the setup. These cables combined with the control knob assembly that came with the Bell have me thinking we are in good shape. I pulled them out and started opening the packaging first cutting away the box. I was happy to see the morse clamp for attaching the cable end under the cabin sole was included with the end fitting to attach the cable to the shifter. I got pretty excited and started removing the tie wraps that kept thing coiled up with my rigging knife. Awesome knife, has a handy marlin spike, shackle key and sharp blade. In the course of my excitement I got careless and slipped. I knew something was wrong when I felt my trusty knife blade strike bone. 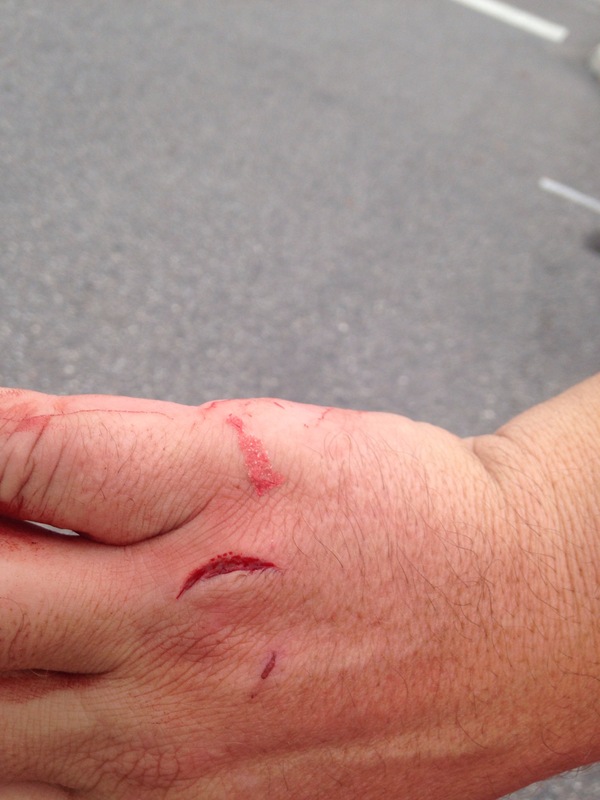 A nice deep gash in my right hand. I immediately applied direct pressure and raised the wound above my heart. Lori and I discussed it and this episode is a good indicator that we need to take a first aid class that includes basic stitching and such. We do have an emergency kit on the boat with strips but we think stitches and proper dressing needs to be added to the portfolio. Now I can not use my right hand for the next 5 days, not the end of the world since I am left handed but still and inconvenience. Not only is the work on the control cables and cleaning out the garage on hold but more is going on. When we got home we found out from our Realtor that the rental house we are selling passed all inspections, we will have to close on it a week from Friday. This is welcome in the long term as it frees me from maintenance concerns on that property but bad in that I need to get a lot of our stuff out of the garage. It looks like this weekend I will be cleaning out that garage and stuffing the junk in our already junk filled garage. Having limited hand use and Lori not being able to help due to the fact we have no desire to stress the baby make me not look forward to this weekend. Will we get the boat going and into the other Marina before our little girl arrives? It looks like very tight at the moment. 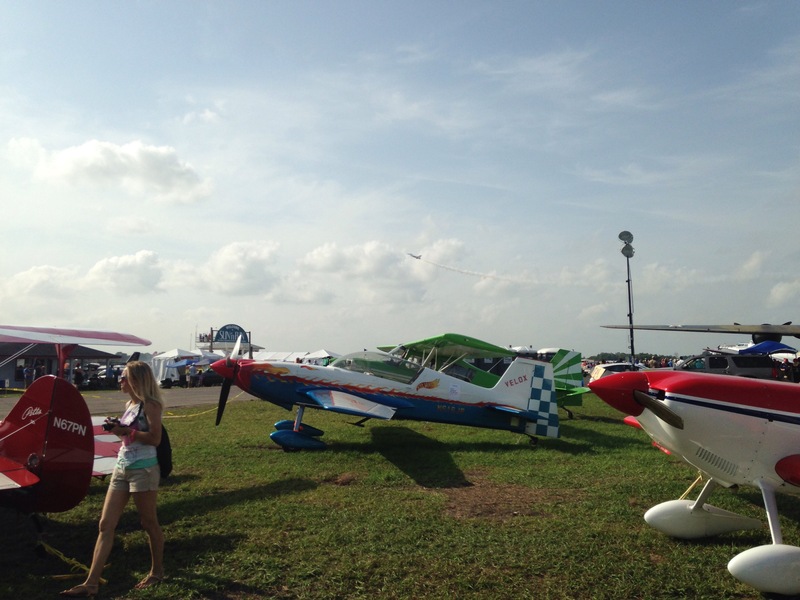 Lori and I were luck enough to attend Fun N Sun, a fly in airshow in Lakeland Florida with friends and family. 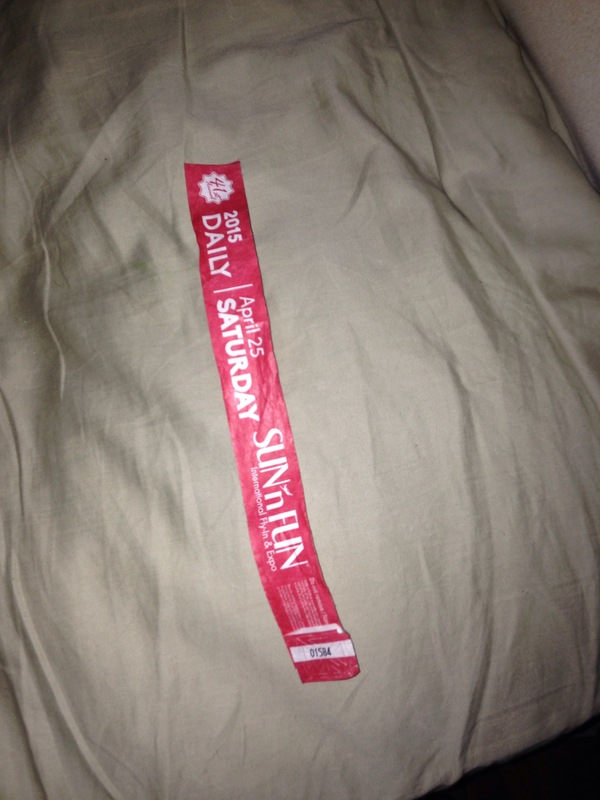 One of our wristbands to the event… Thank you Di and Bunk for everything. 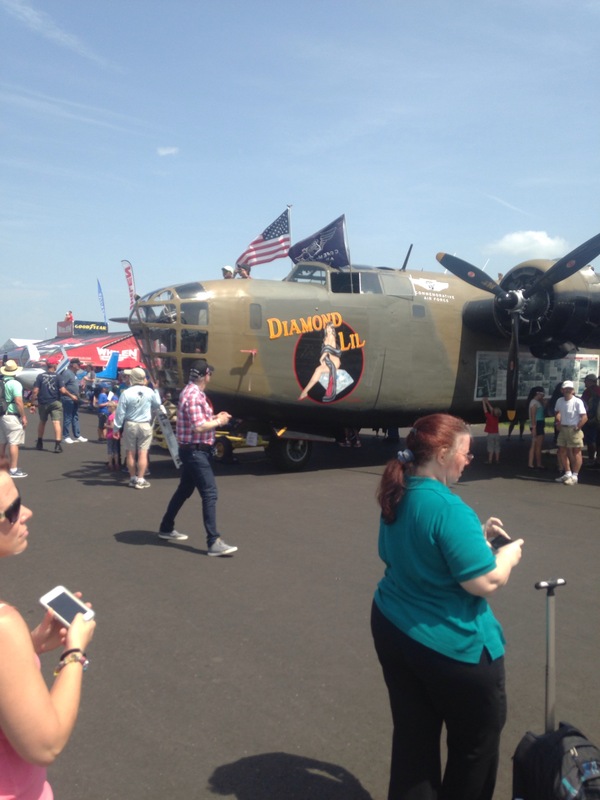 If you have never attended an airshow let me say they are fun. 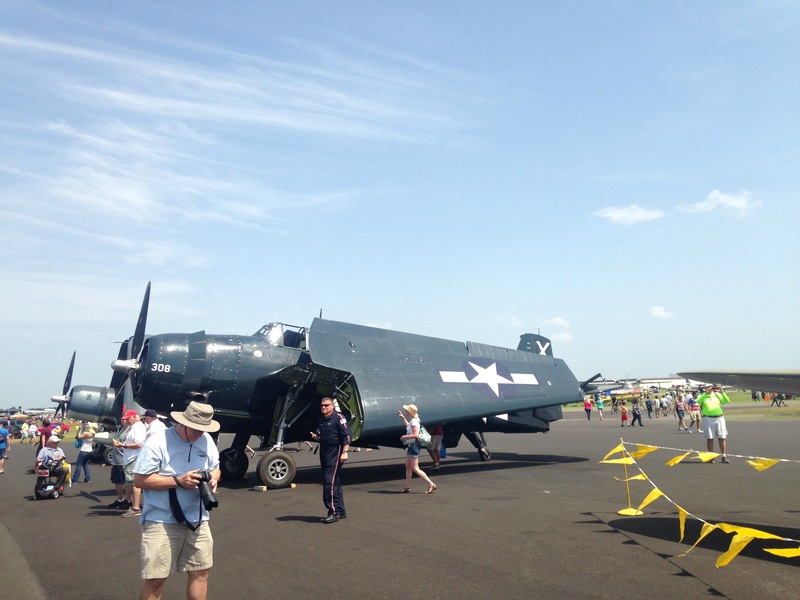 They have static displays in addition to flight demonstrations. This show is even better as it is at a private facility and a large percentage of the attendants fly in for the show. 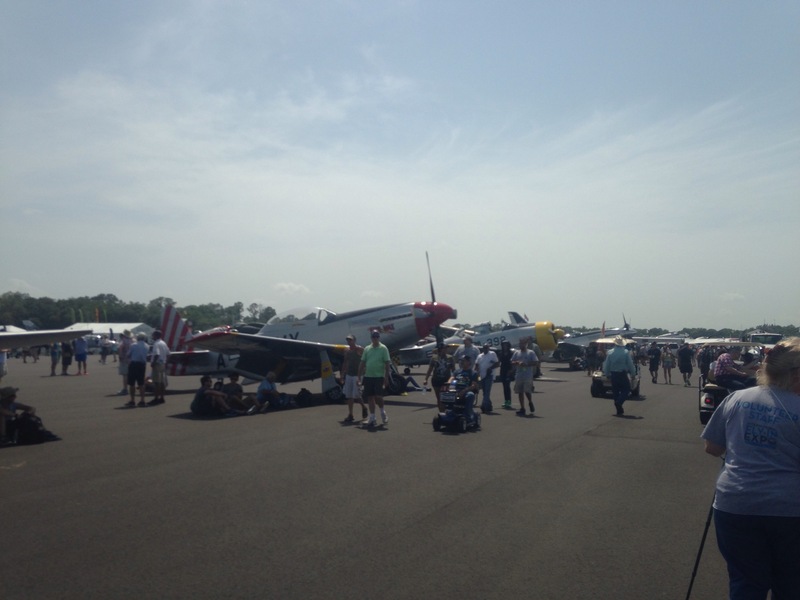 All the static displays arrived under their own power. 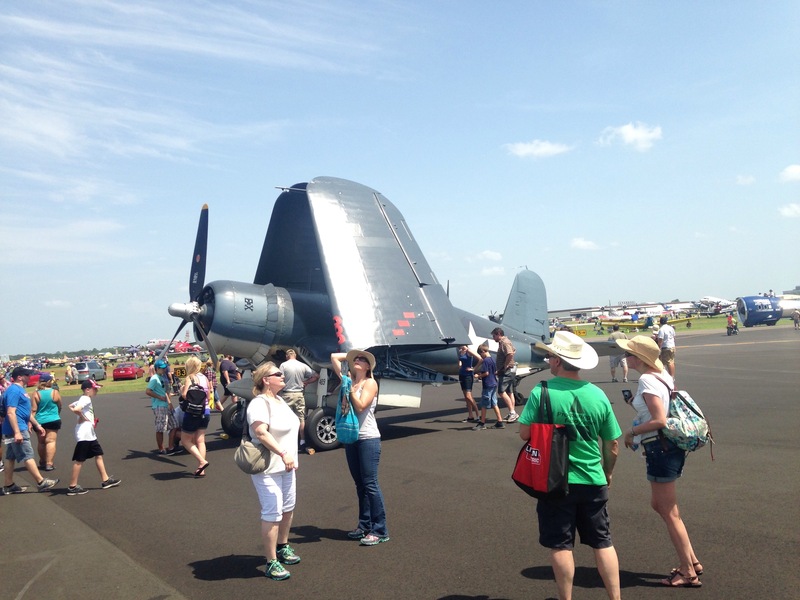 There were also a ton of non military planes on display, all of which we could walk around and look at and touch if desired. A lot of the private planes were for sale. 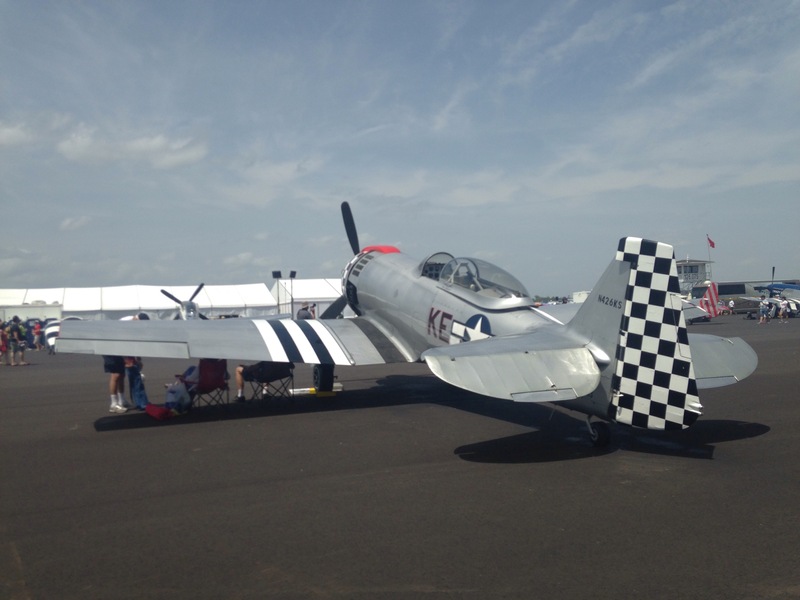 As we walked around there were acrobatic demonstrations going on, old warbirds, new biplanes, commuter planes, helocopters, all types. 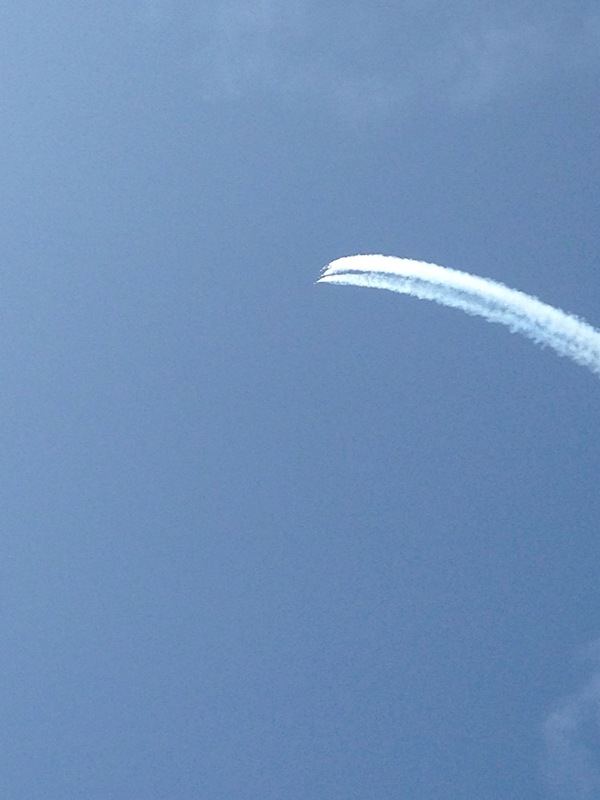 Of course the the highlight of the day was the AirForce Thunderbirds flying their F-16s. They were great. Starting their show at 5pm and going for quite a while. After the the Thunderbirds we got to witness the spectacle of all the folks that flew in rushing to get out of the airport before dark as they close the airport after dark for the fly in and some folks did not wish to spend the night. 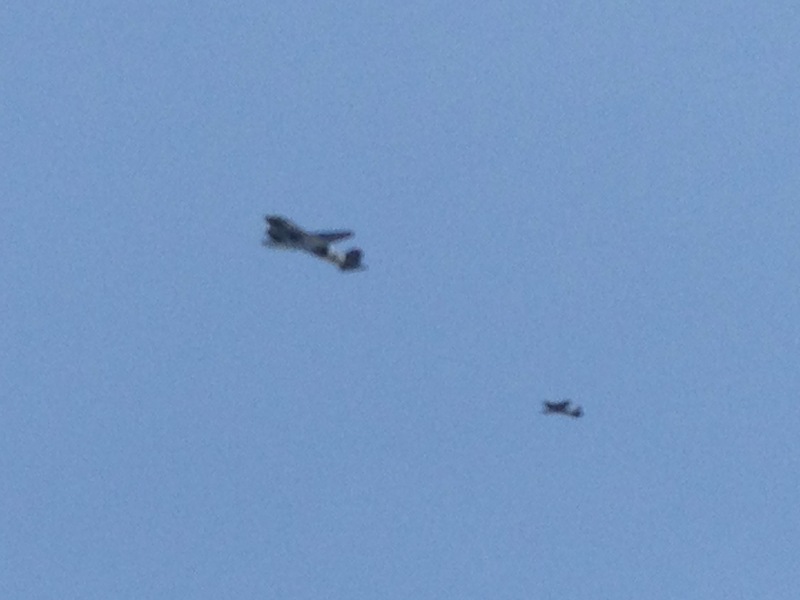 This included some of the larger planes including the B-17. 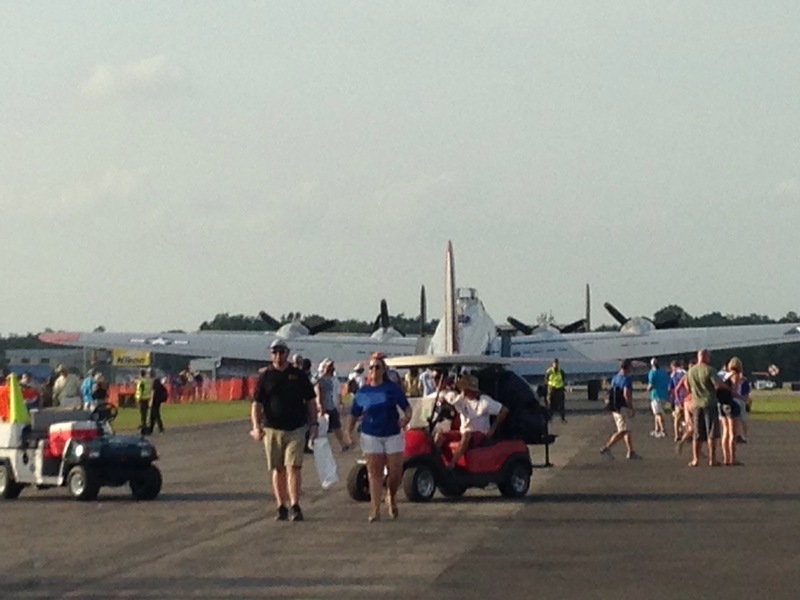 B-17 moving down the flightline. Note that spectators are still close by. 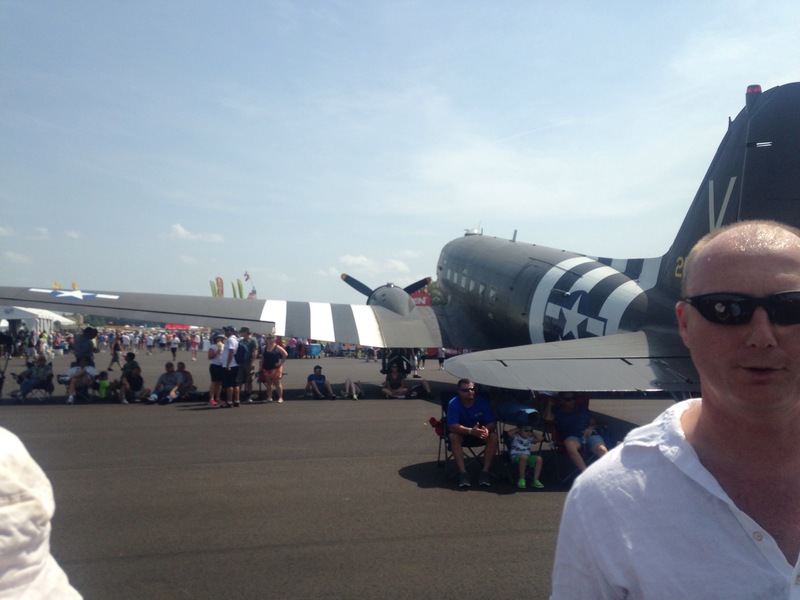 As we were sitting sitting in a tent a lot of planes taxied by on their way out to the runway. After things quieted down a bit we took all hopped in the back of Bunk and Di’s truck for the ride back to their place. The ride back gives you a hint of the scale of the event. 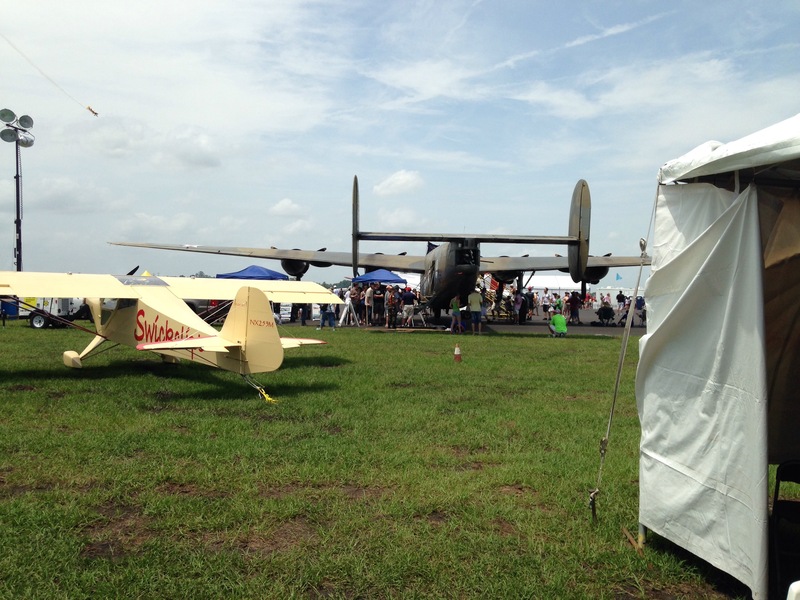 Note the tents set up by a large number of planes so their pilots could stay the night. After getting back their puppy was thrilled to see use. What a spectacular time. A must do.